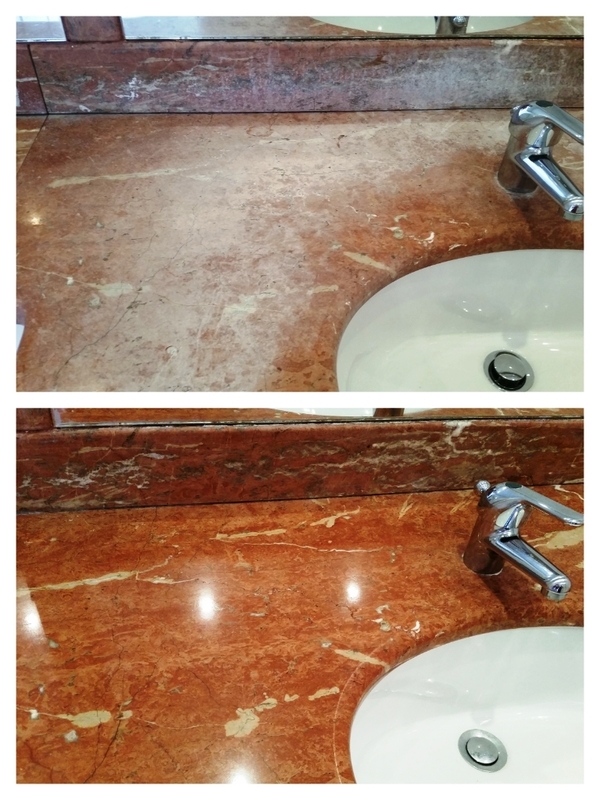 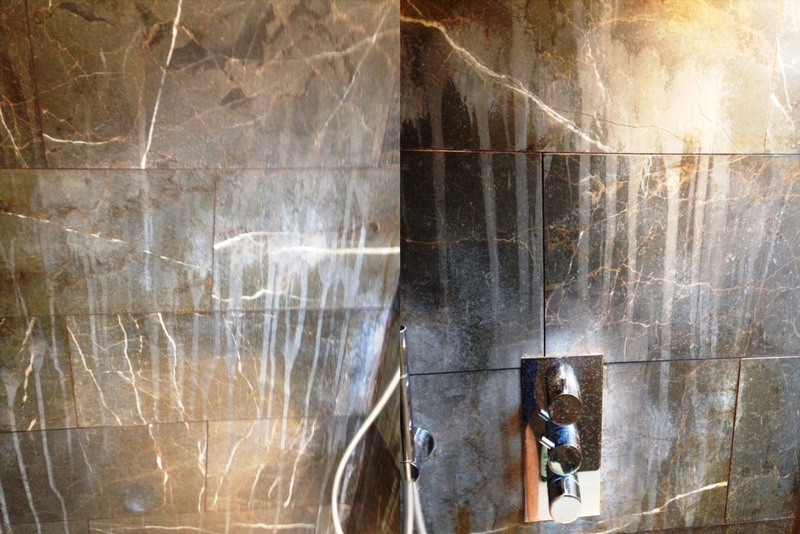 My client asked me to take a look at a very dirty Marble Onyx countertop in her home in Hampstead which is located within the London Borough of Camden. 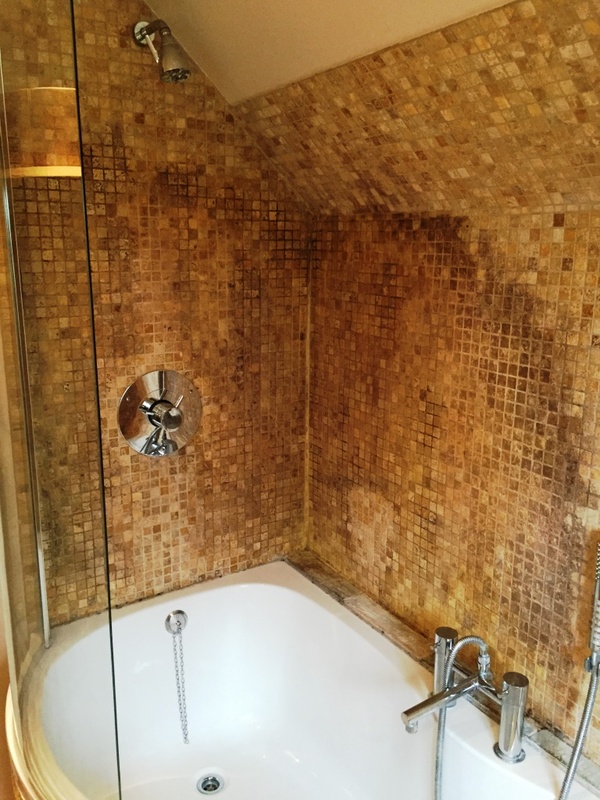 Interestingly, Hampstead is home to more millionaires than any other area of the UK so if you’re going to find bathrooms of this standard this is the place. 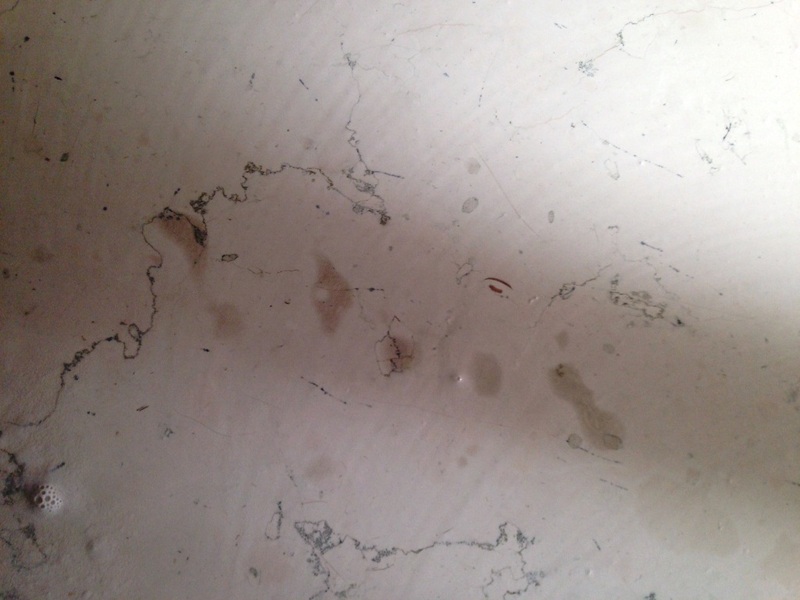 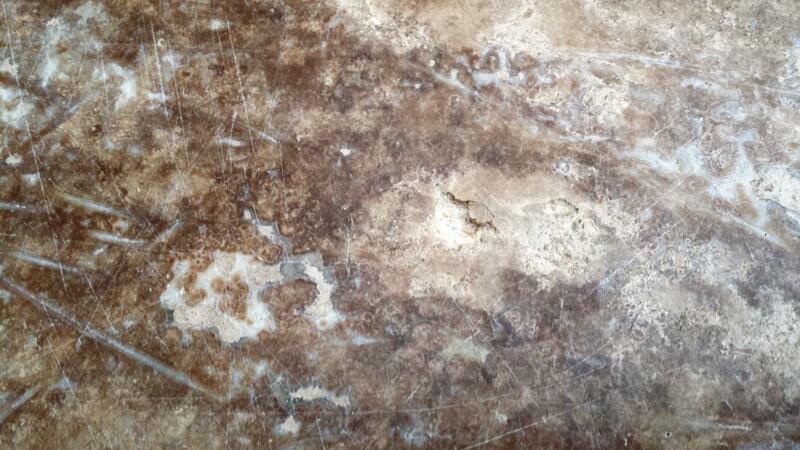 This particular worktop had been heavily soiled by roughly fifteen years of soap scum and old sealer. 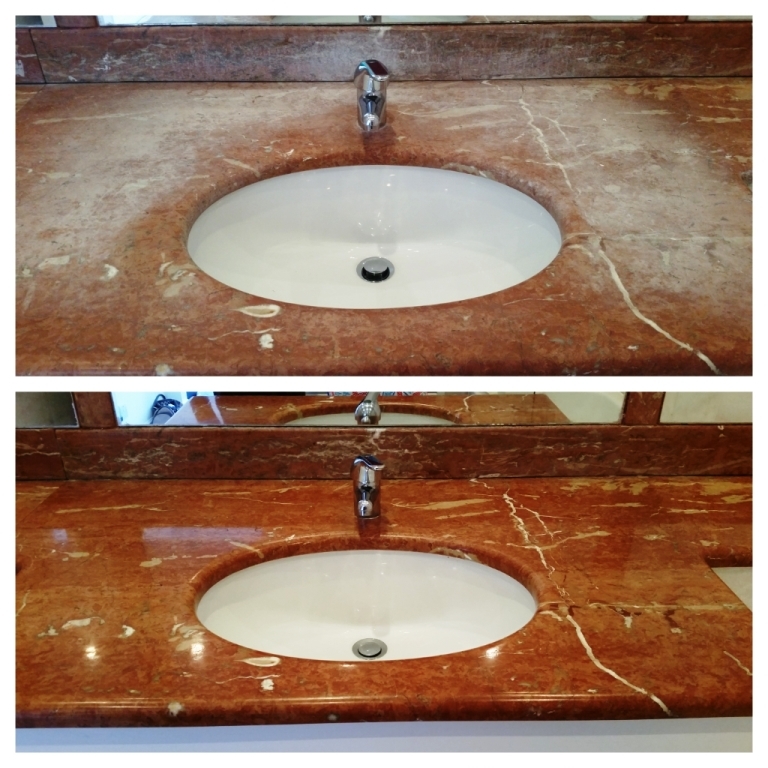 It would take a thorough clean as well as a fresh seal to get this countertop back to looking its best. 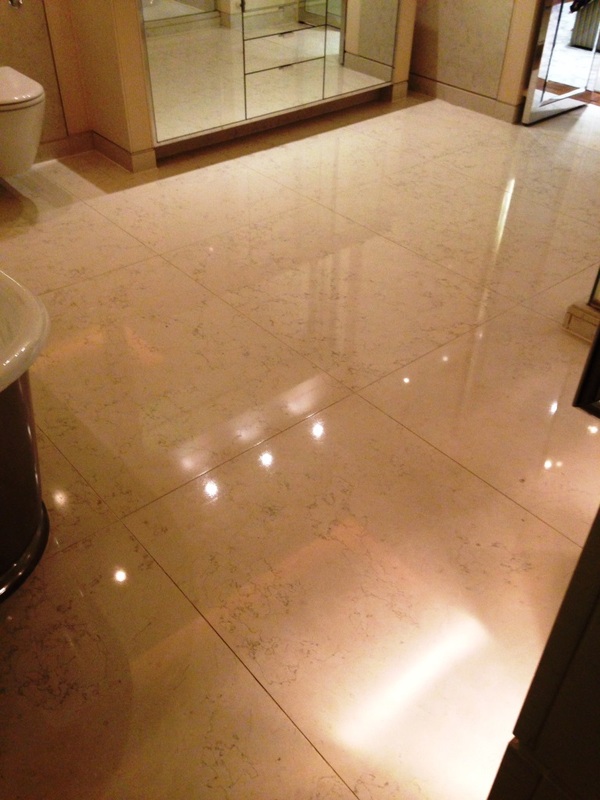 Marble is a fantastic type of stone which has, throughout history, been used to forge beautiful, yet resilient surfaces. 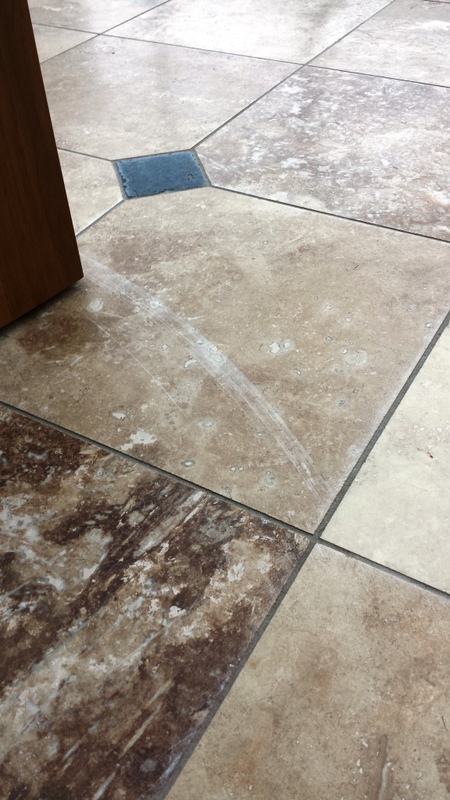 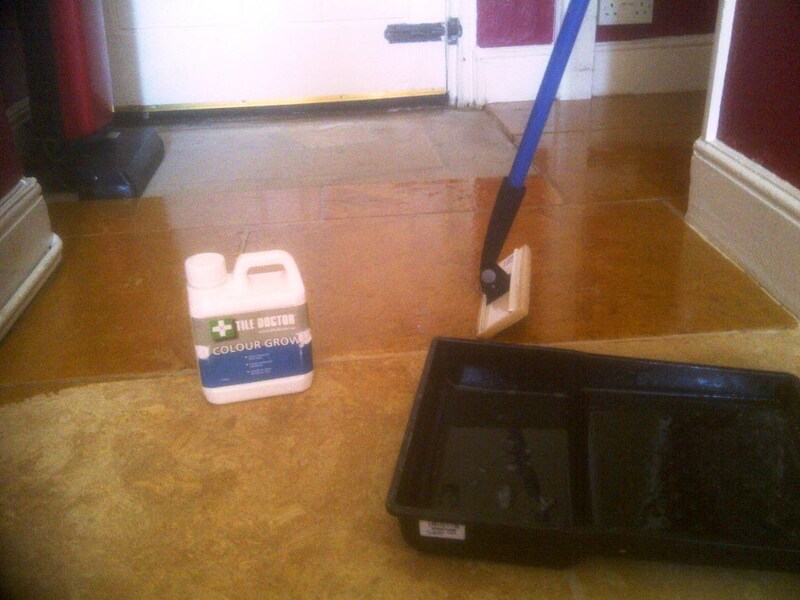 I immediately set to work cleaning the countertop using a strong solution of Tile Doctor Pro-Clean. 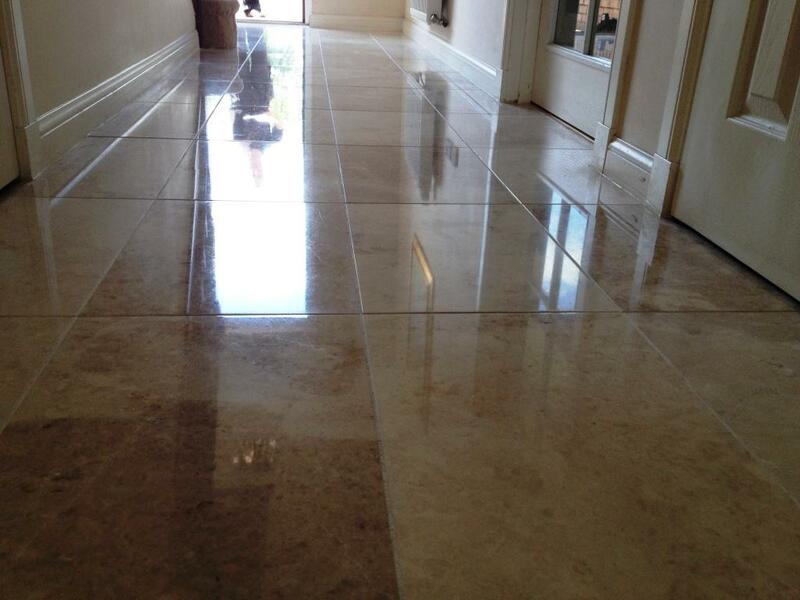 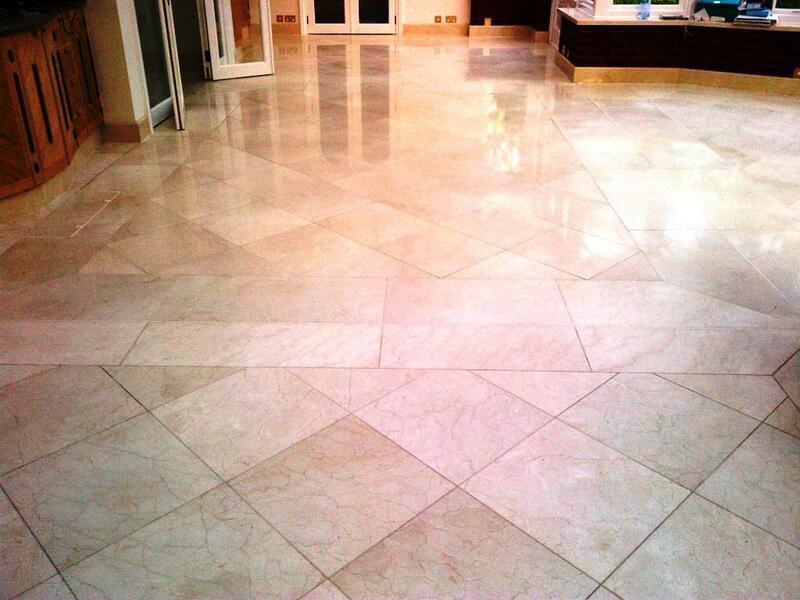 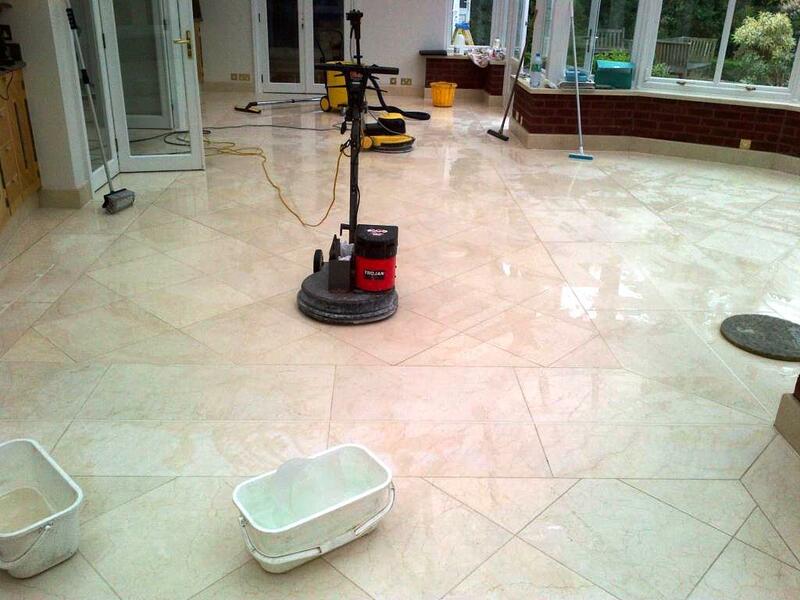 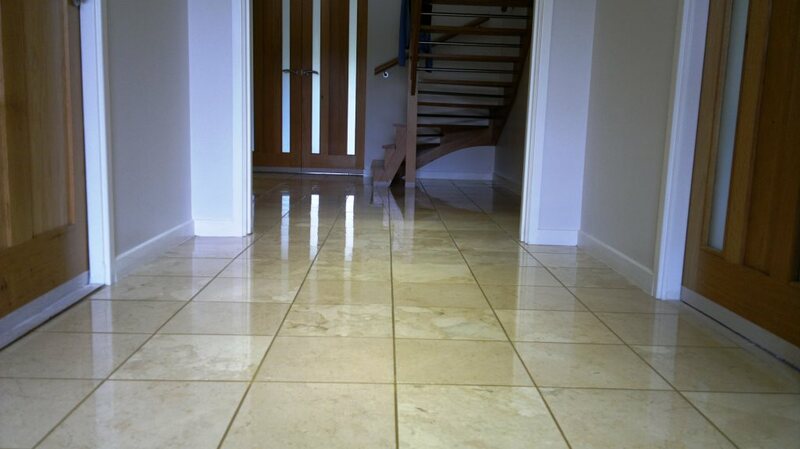 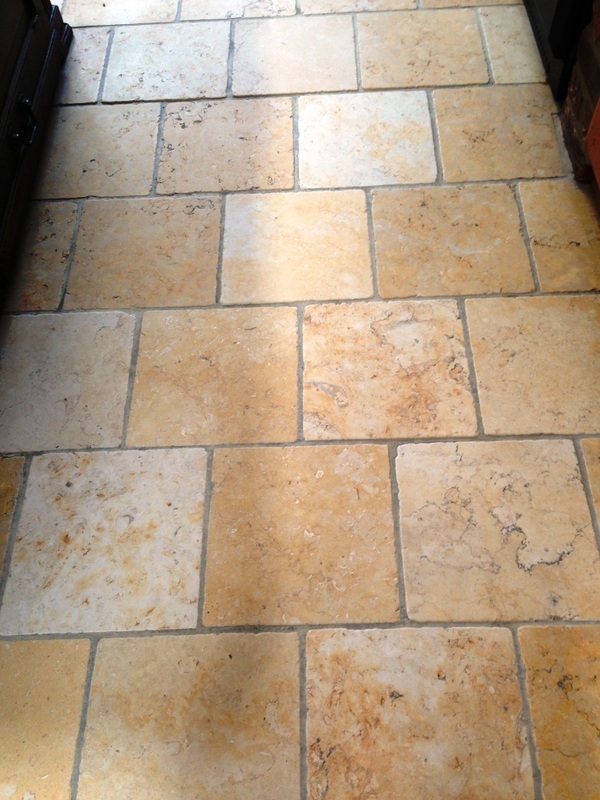 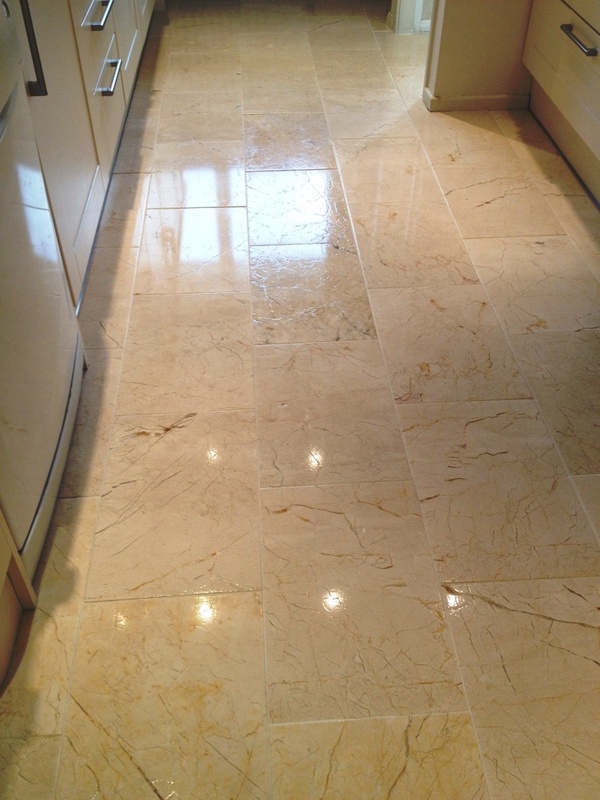 Pro-Clean is an alkaline product and therefore suitable for use on natural stone, meaning that, along with Marble, it is also suitable for use on Limestone, Granite, Slate, Travertine, and others. 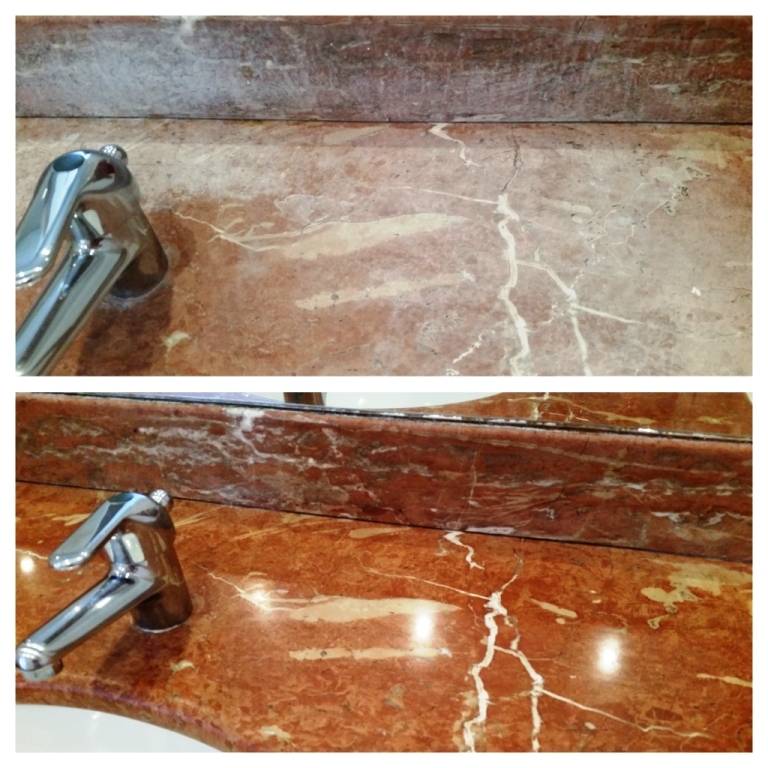 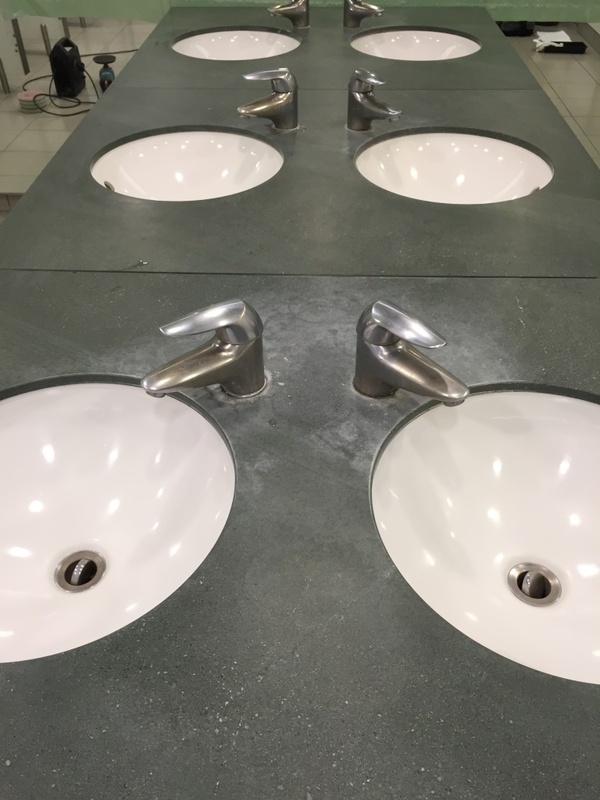 After leaving it to dwell on the surface for a short period of time, I began scrubbing the solution of cleaner into the Marble, and gradually the years of soap scum, old sealer and ingrained dirt began to come off. 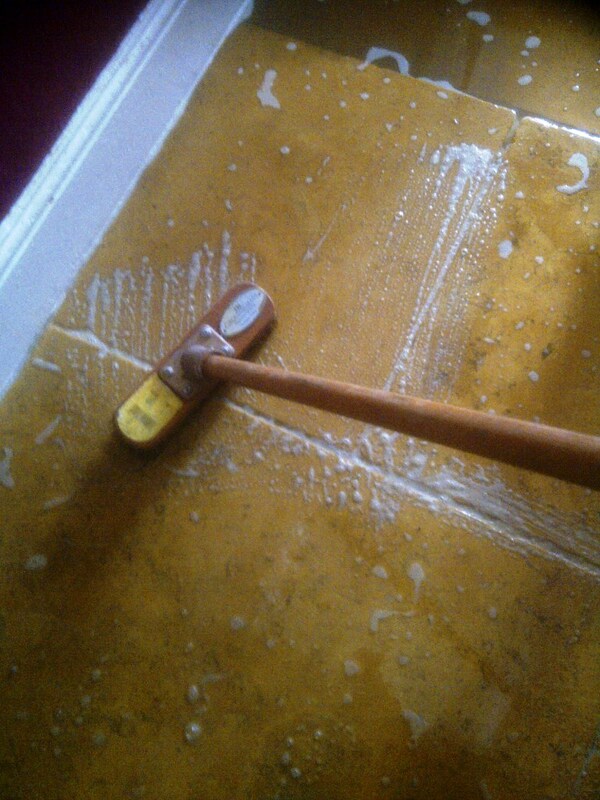 It was amazing just how quickly I was able to remove many years of muck with a bit of elbow grease. 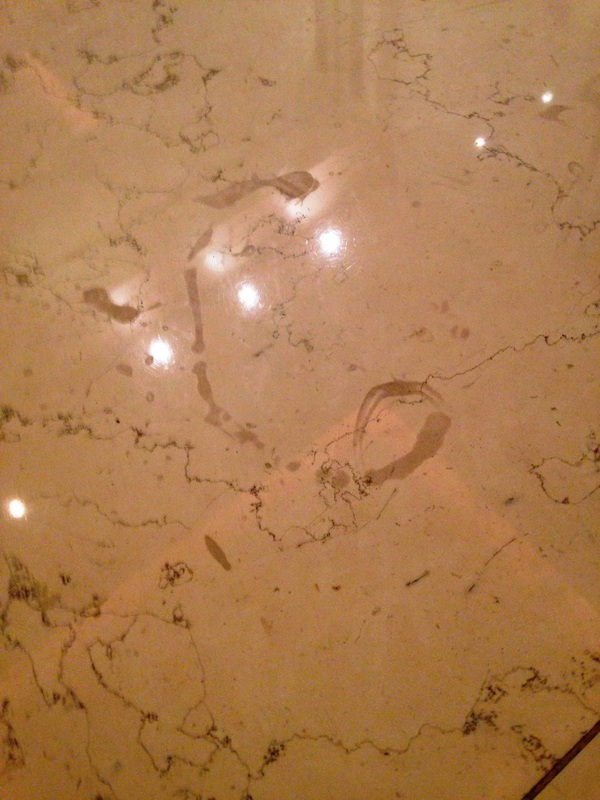 Following this, I rinsed off any excess cleaning product with clean water and then left the surface to dry, before I began the process of burnishing the Marble countertop using small six inch burnishing pads starting with a coarse pad and then moving up to super fine. 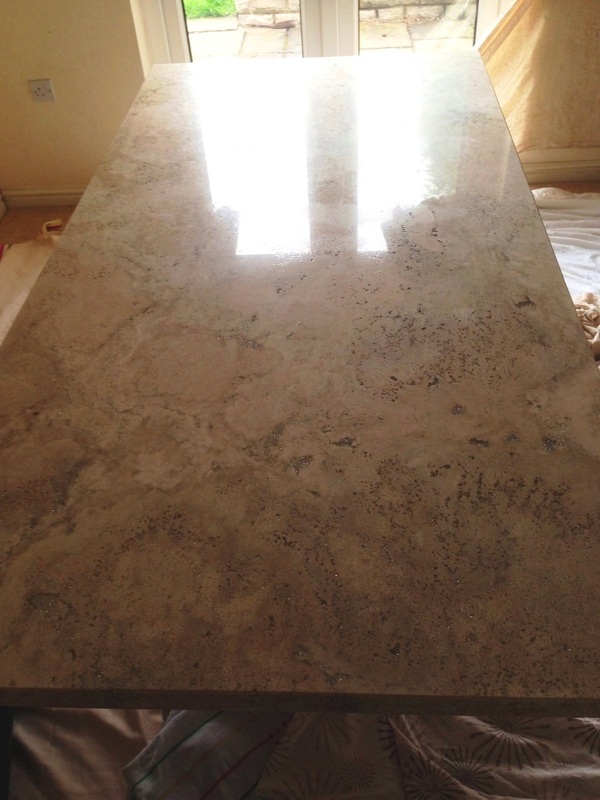 After the burnishing process was complete, I gave the surface a rinse followed by an additional polish with a buffing pad until the shine was fully restored to the worktop. 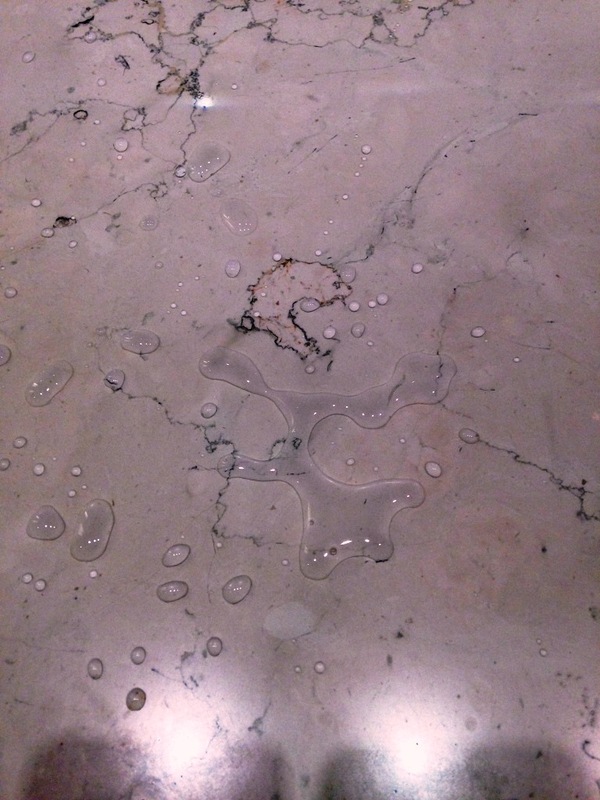 After ensuring the countertop was fully dry following the cleaning and burnishing processes, I set about providing the surface with a fresh seal. 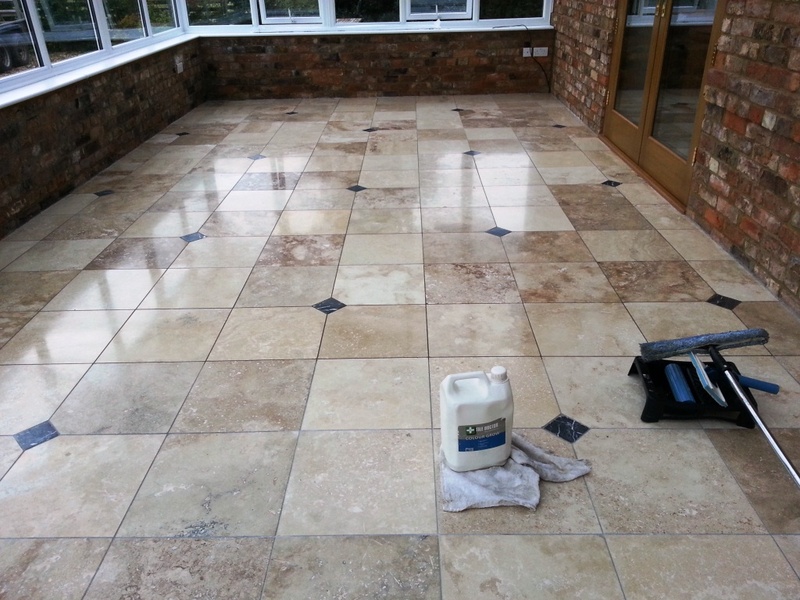 My choice of sealer was Tile Doctor Colour Grow, an impregnating sealer which is designed to both provide durable surface protection, whilst also intensifying the natural colours within the stone. 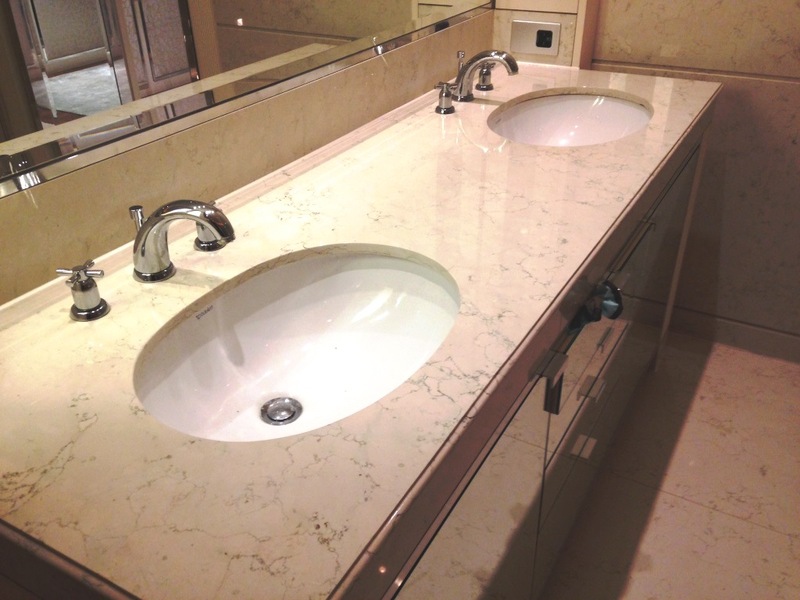 I applied a layer of Colour Grow carefully to the countertop, and the Onyx shades within the Marble really came to life once again. 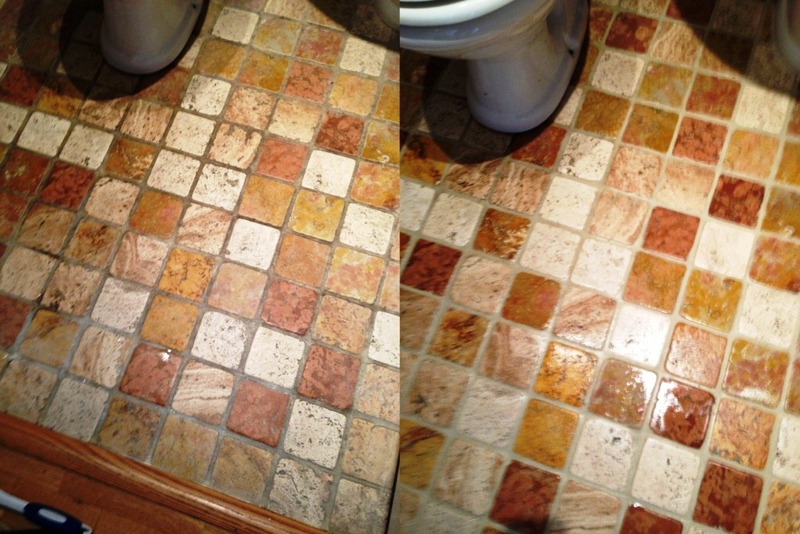 I was very happy with the results overall, as was my client. 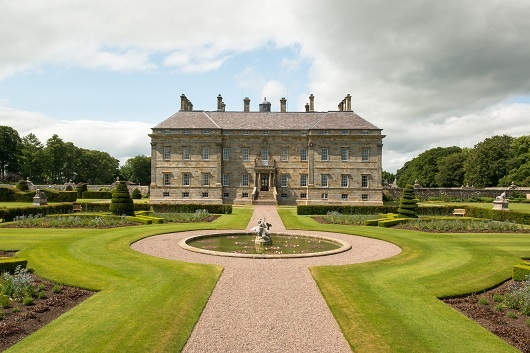 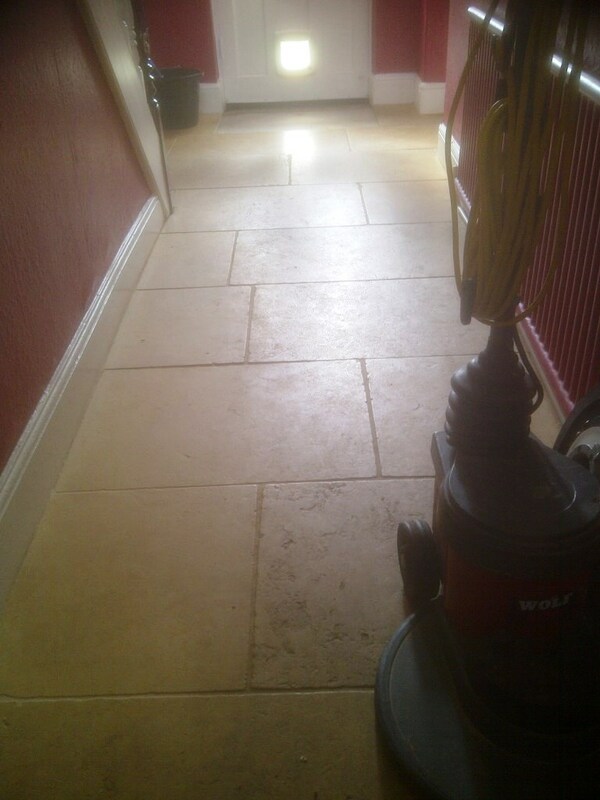 It is very rewarding to think that hard work can go a long way to quickly restoring a surface which had been hidden for so long by many layers of muck. 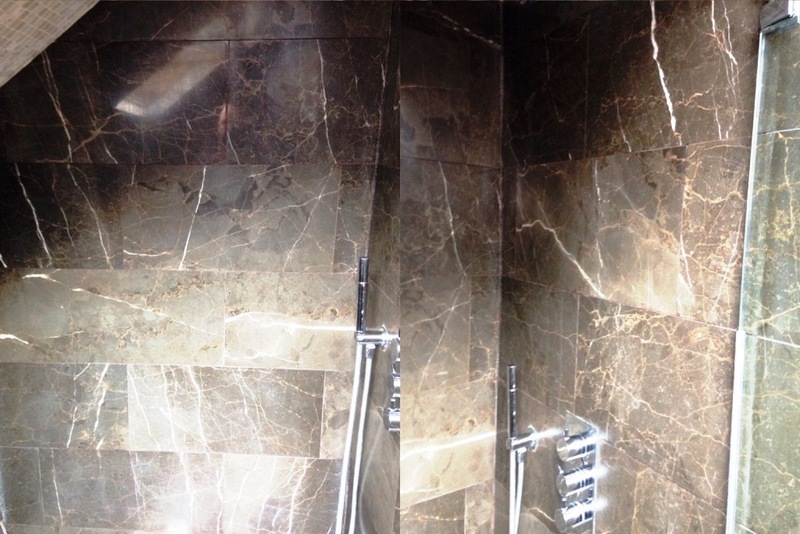 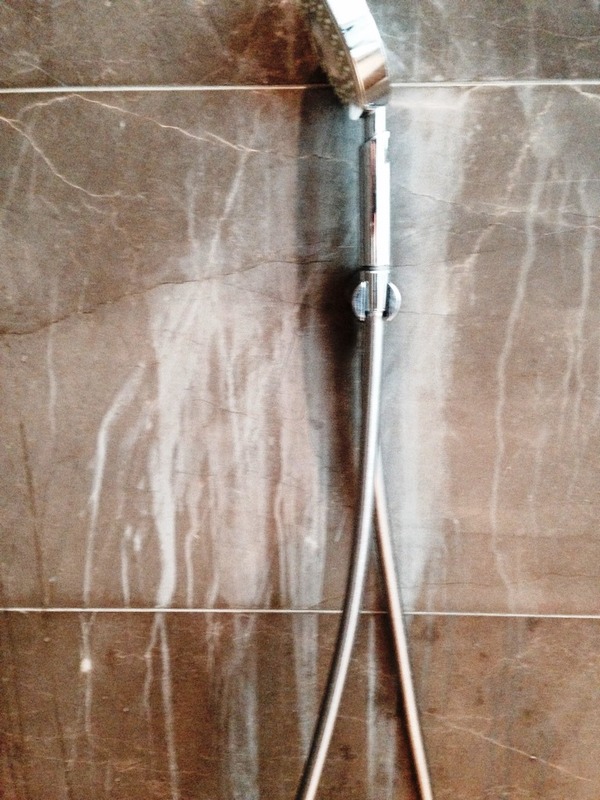 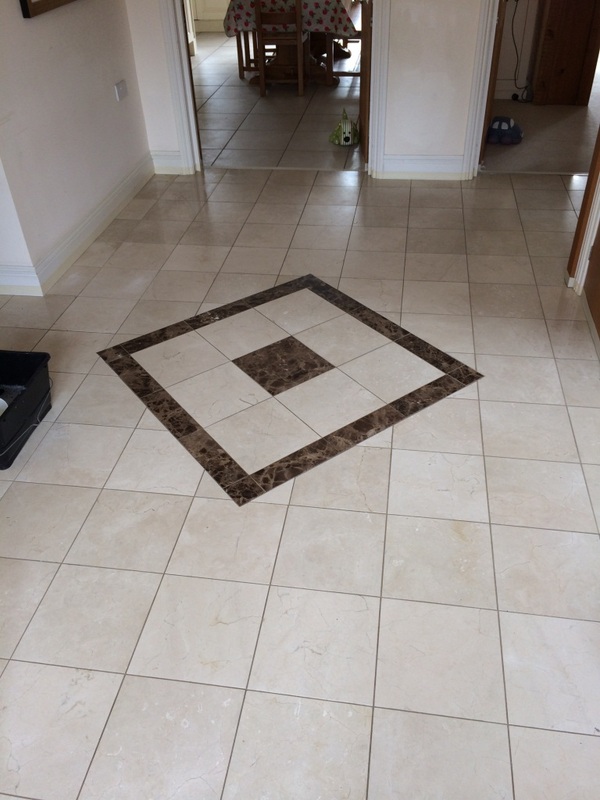 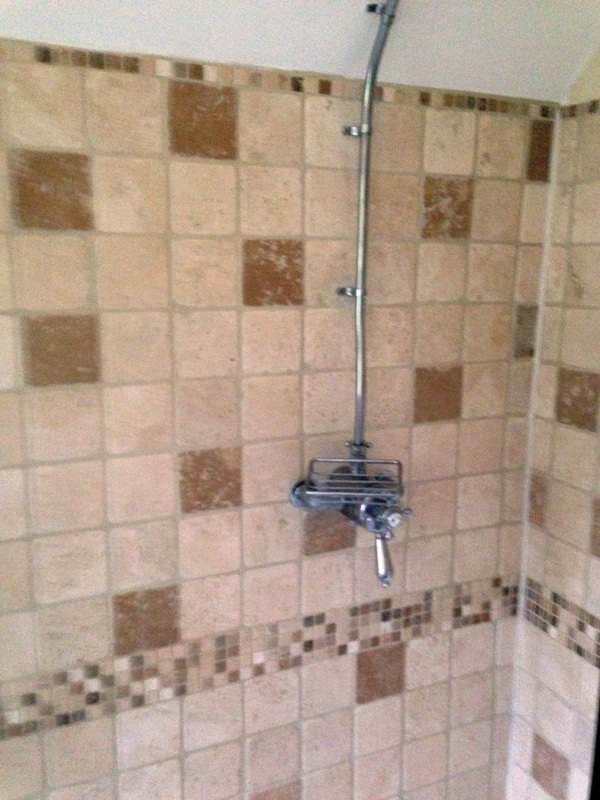 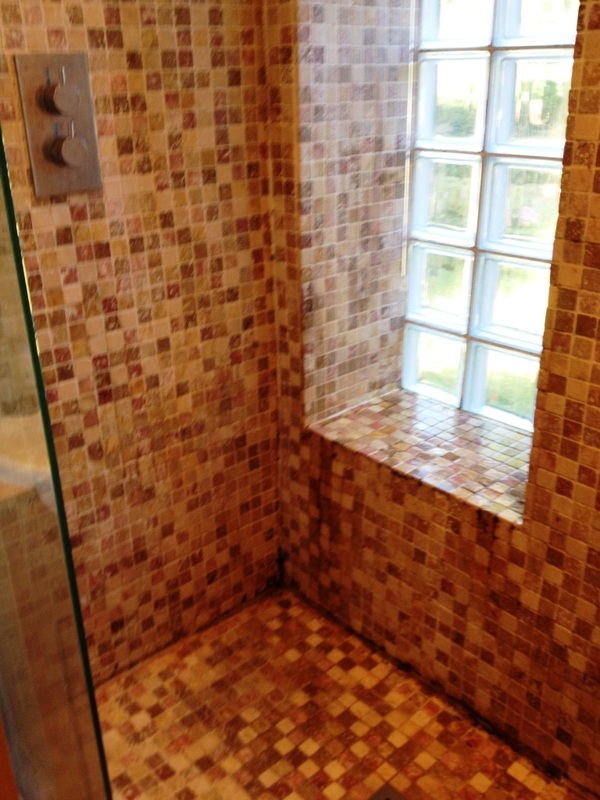 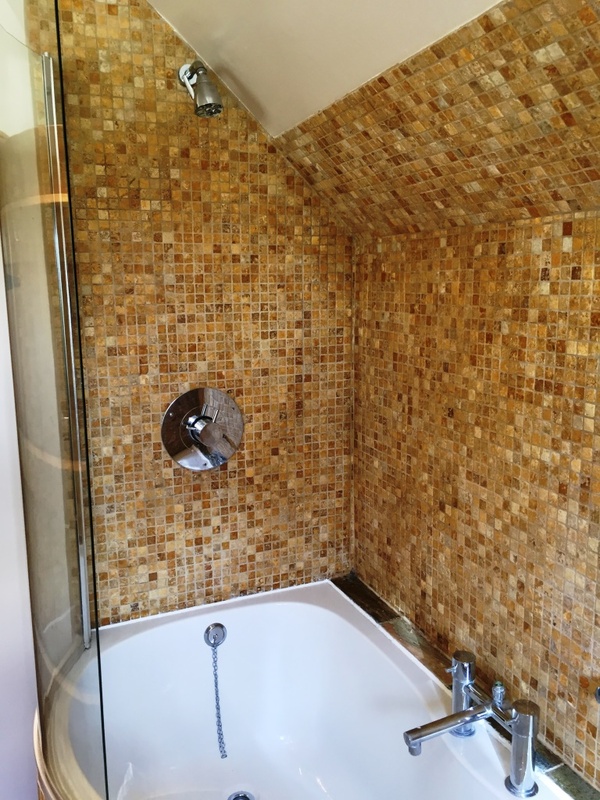 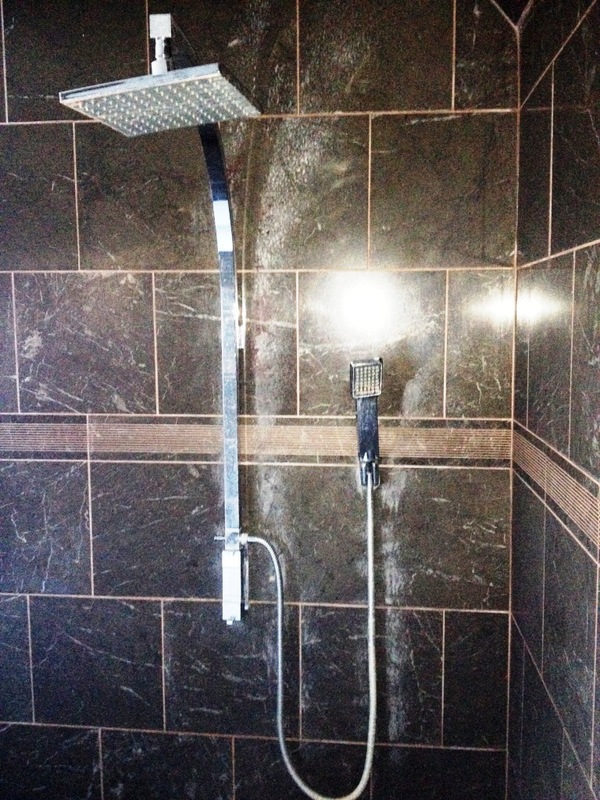 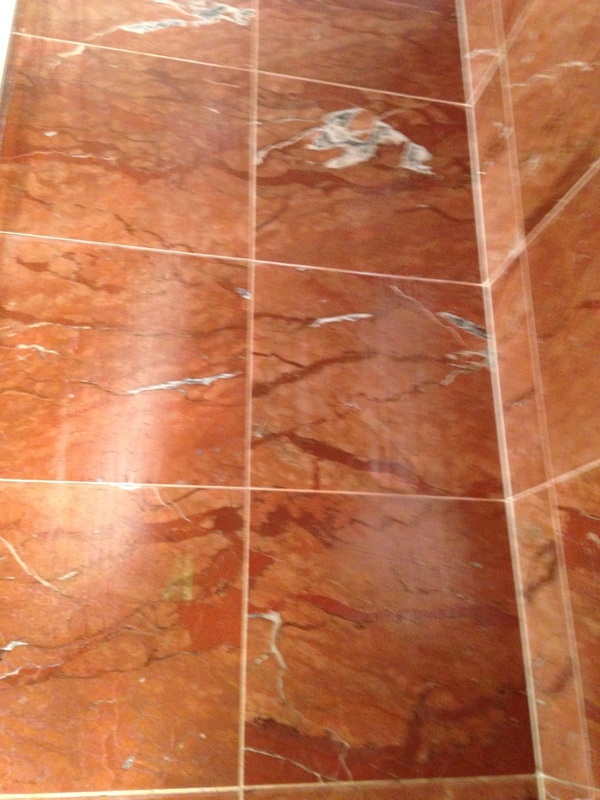 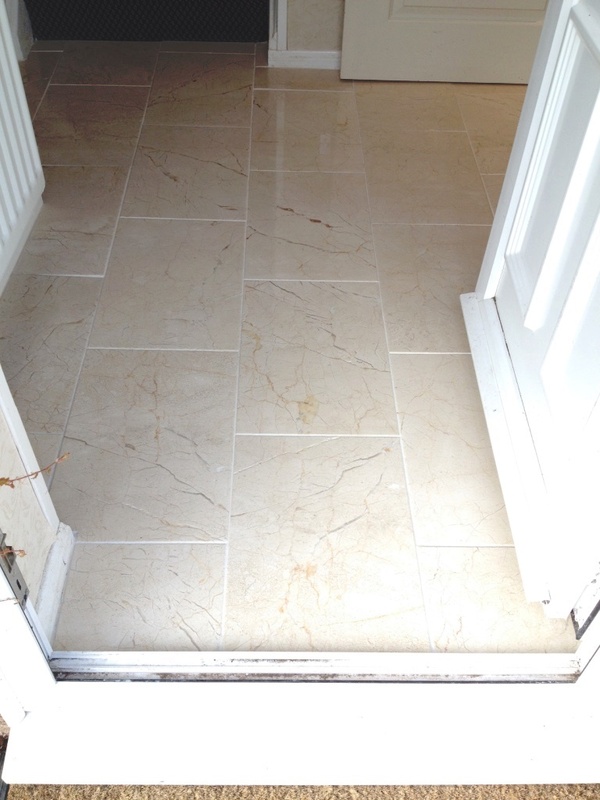 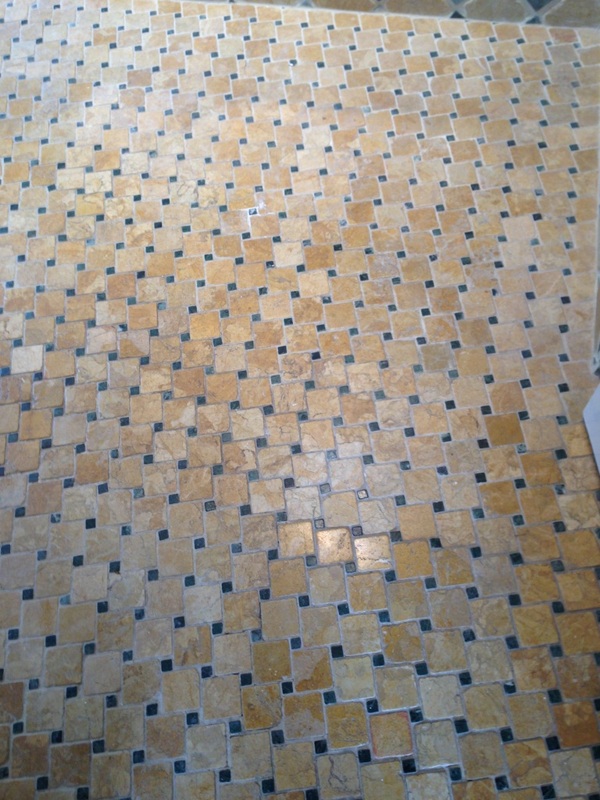 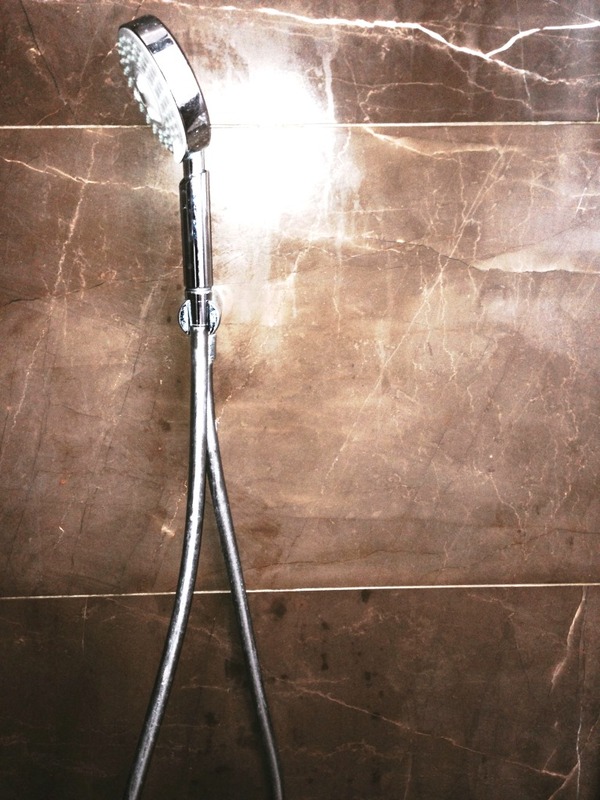 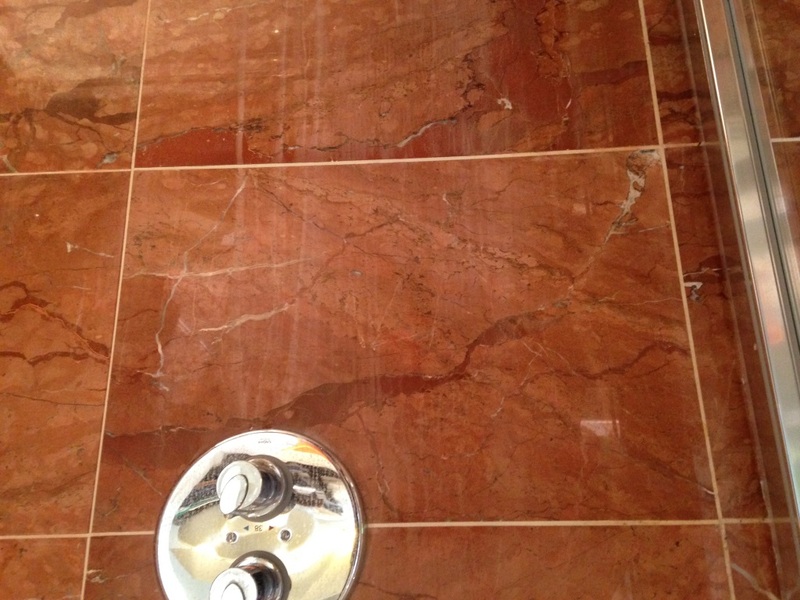 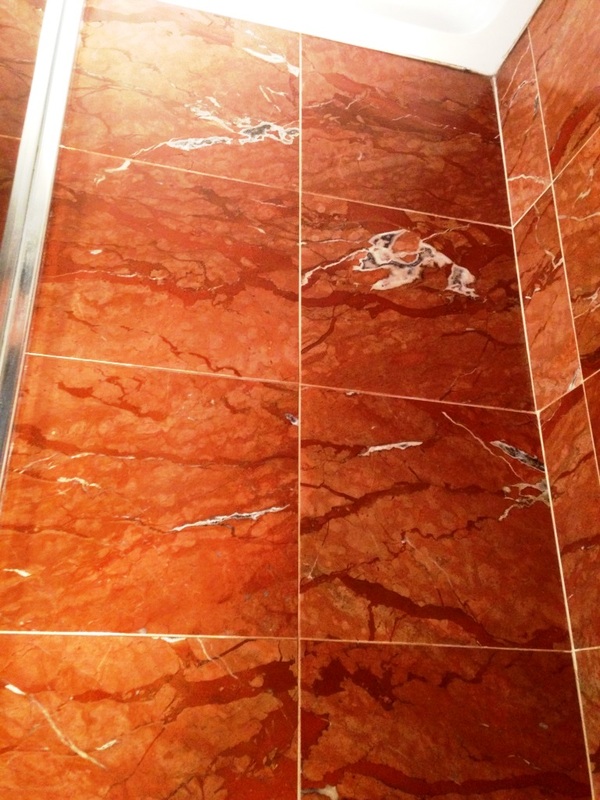 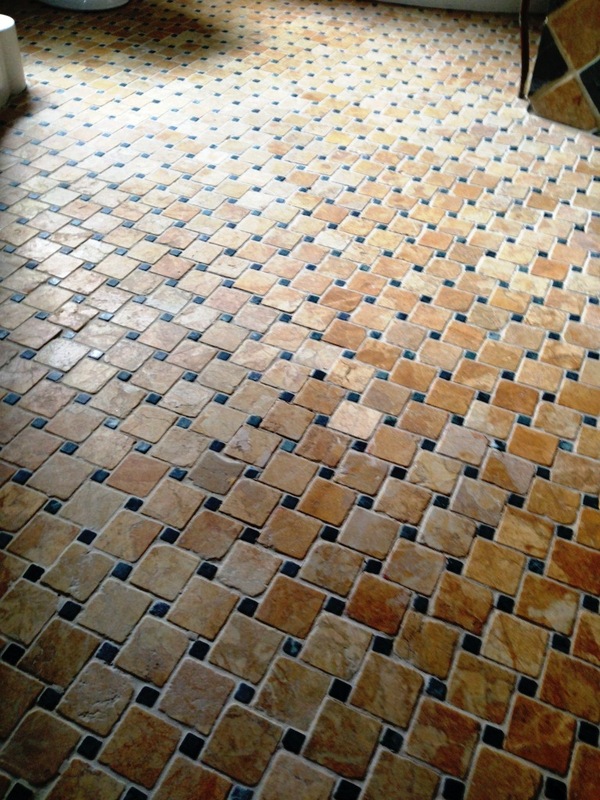 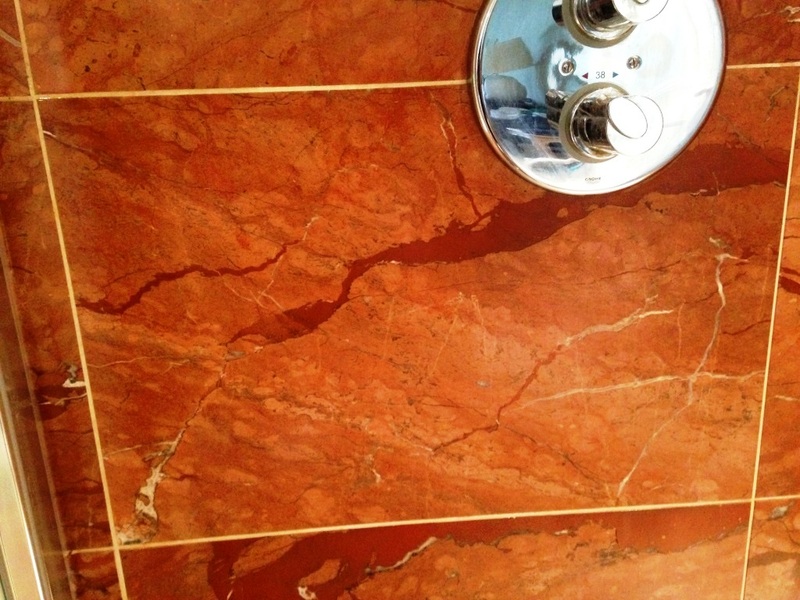 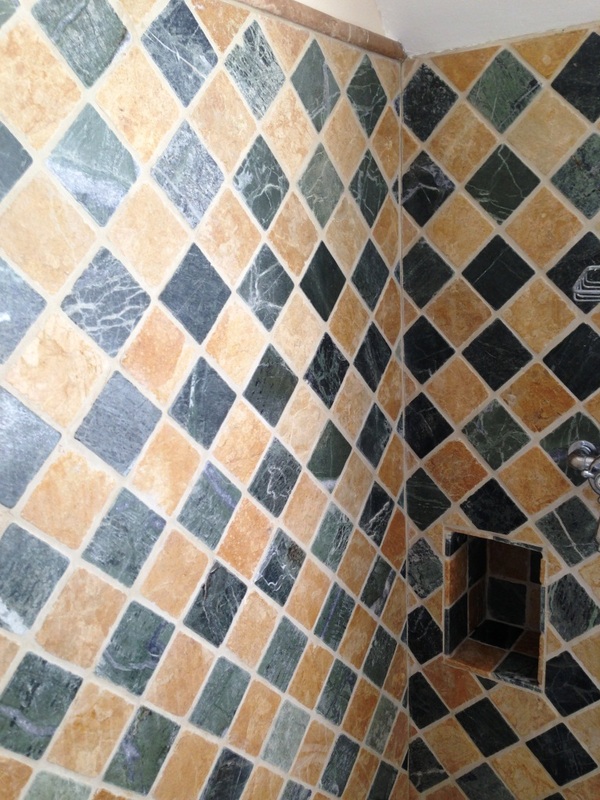 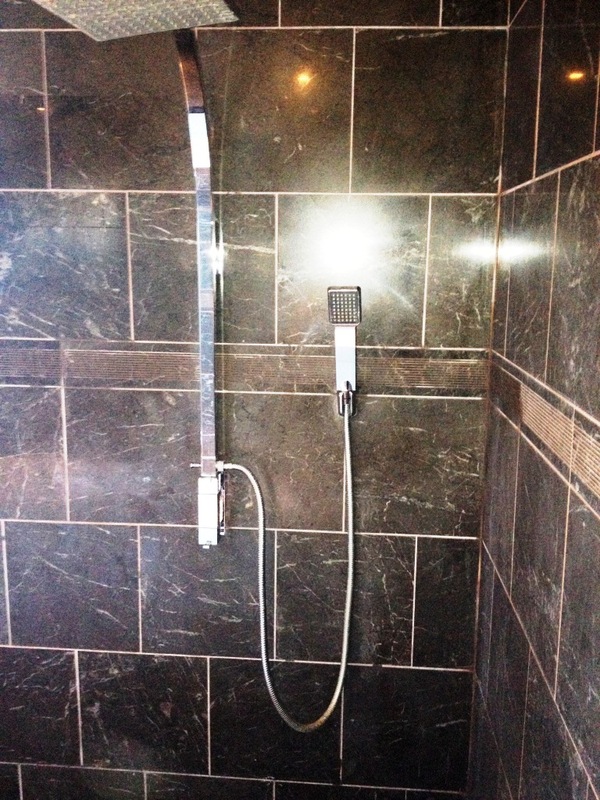 We were recently received a referral from a well-known house cleaning company who needed some assistance to resolve an issue with a Marble Tiled Shower at a Georgian property in Ringmer. 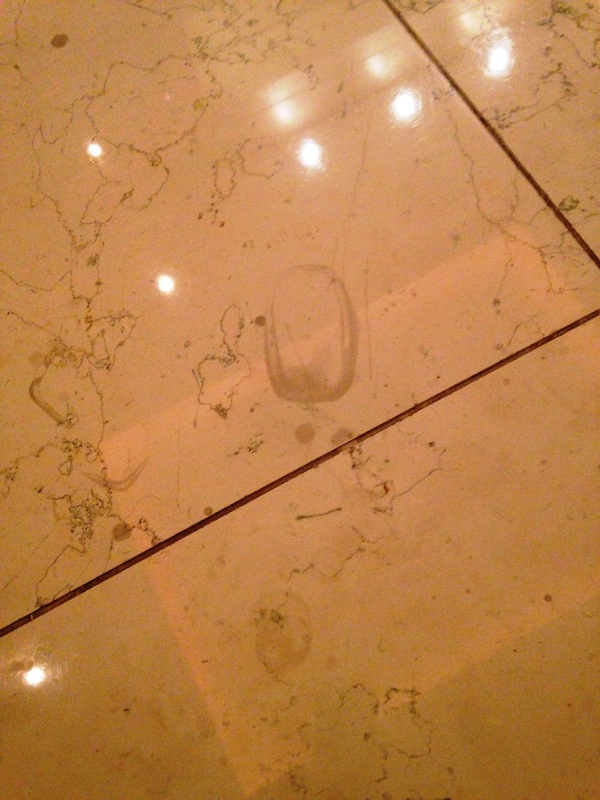 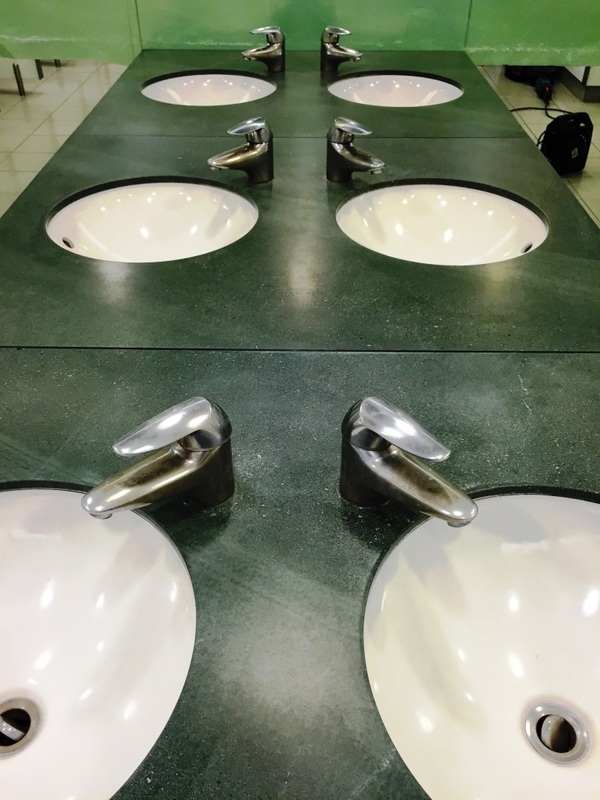 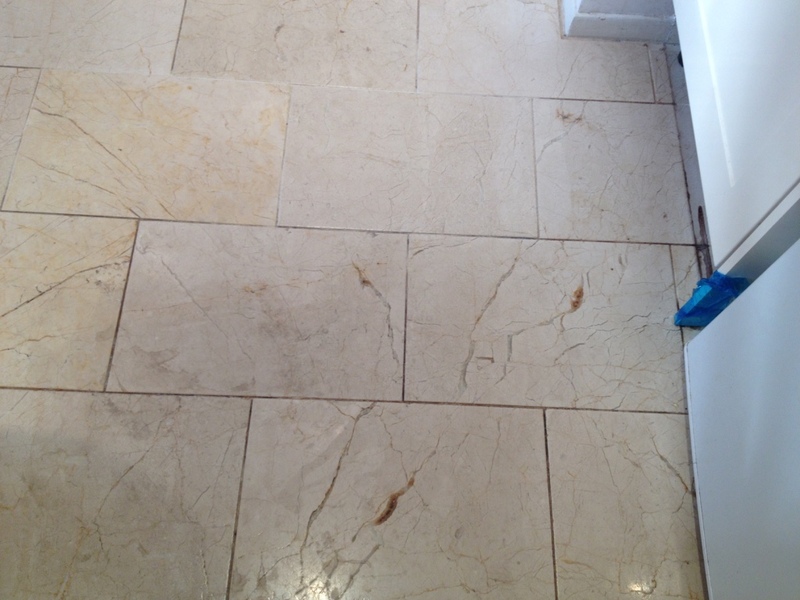 Unfortunately one of their staff had sprayed a Cillit Bang cleaning fluid onto the tiles to remove Limescale deposits and had marked the tiles with white streaks which could not be removed. 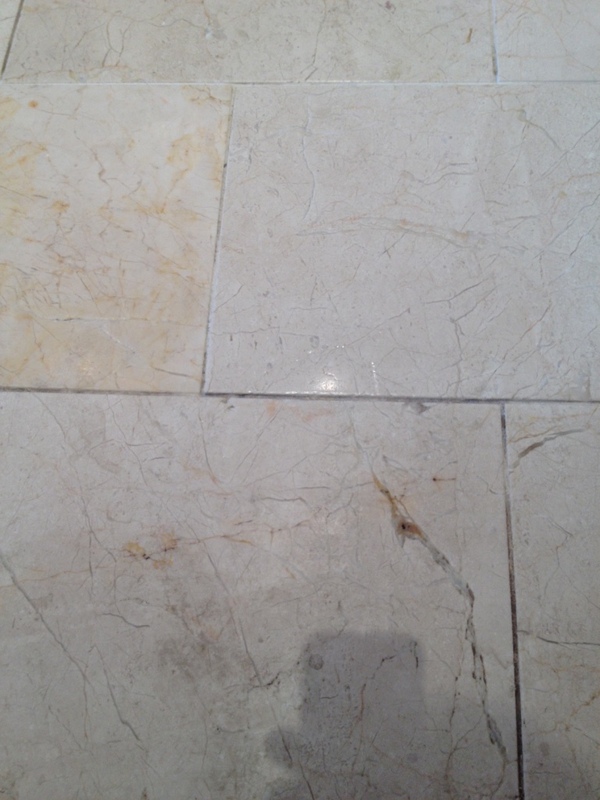 Now Cilit Bang is a very strong product and although it has a reputation for tackling tricky cleaning problems it contains Benzenesulfonic Acid which like any acid should not be used on Stone as it will damage it. 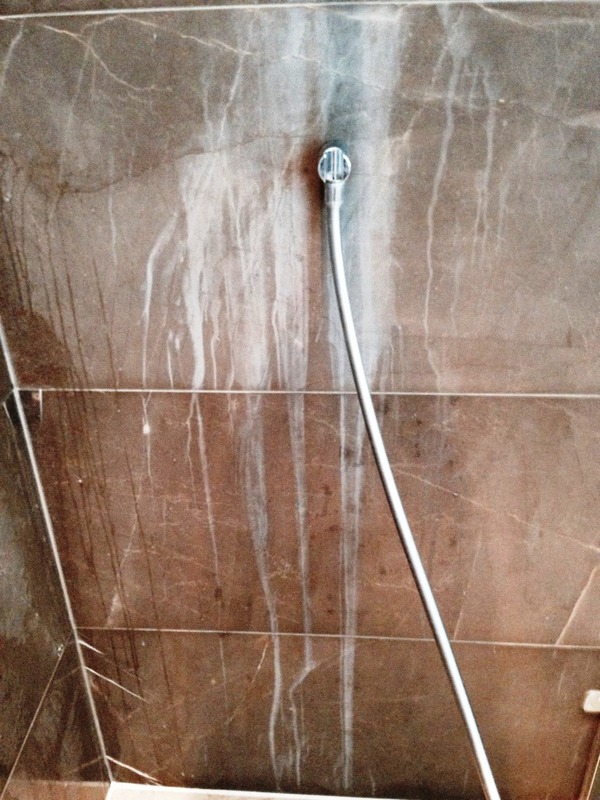 If you check the internet you will find this problem is not uncommon and numerous people have experienced the same issue, the good news is there is a solution. 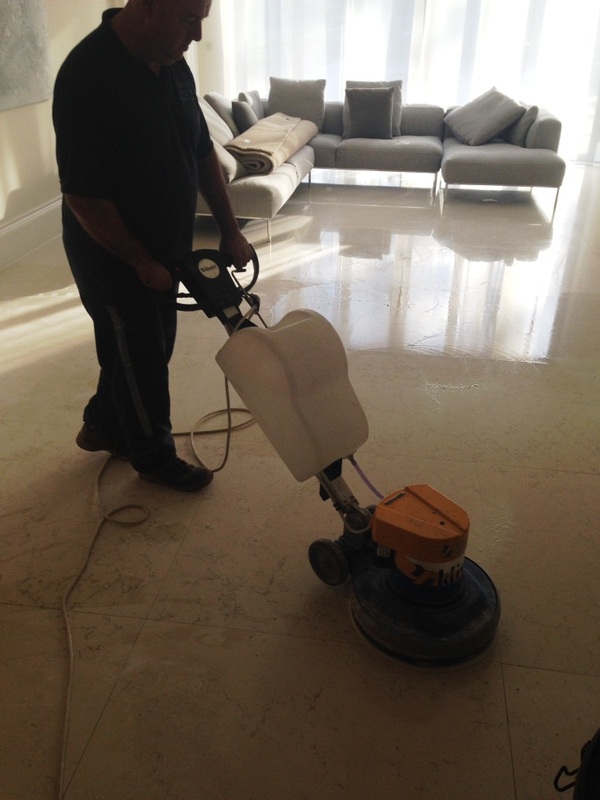 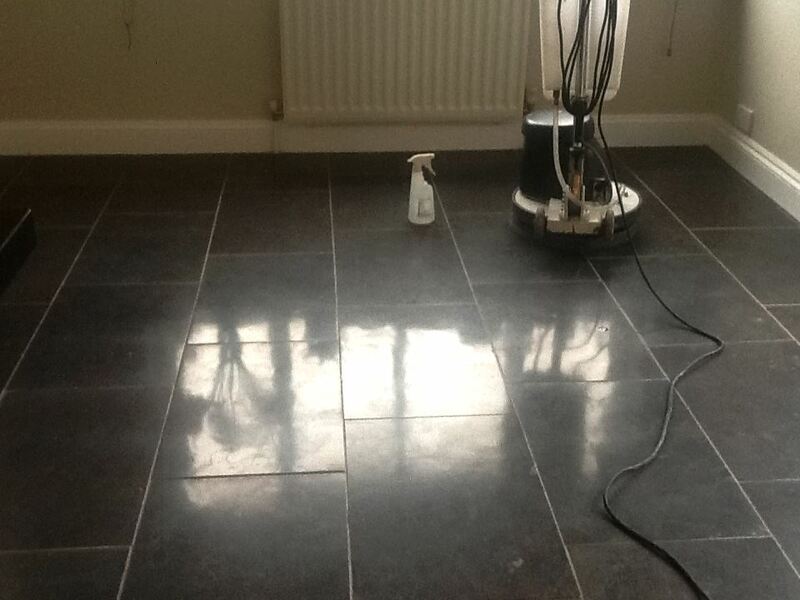 Using a spray bottle containing a dilution of Tile Doctor Pro-Clean and a set of small Diamond encrusted burnishing pads attached to a handheld buffer I went to work on the tiles stripping away the existing sealer and bringing back the surface of the stone. 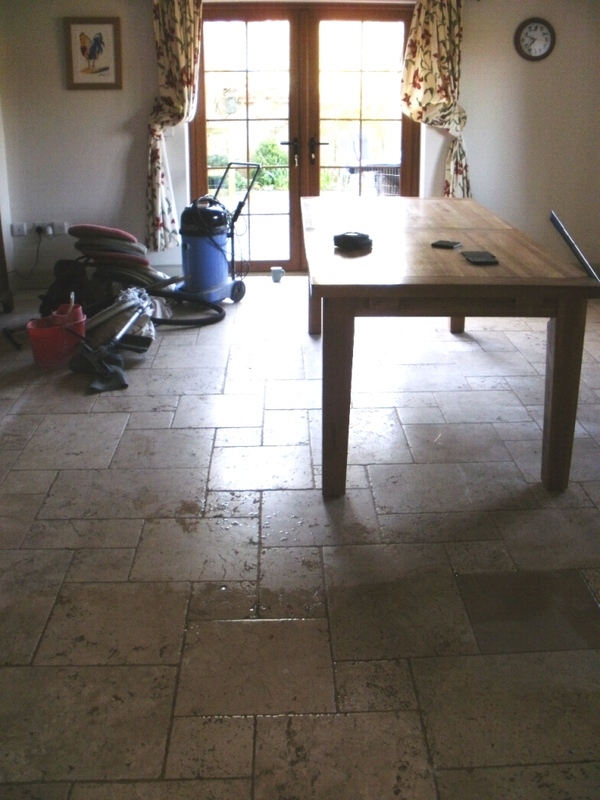 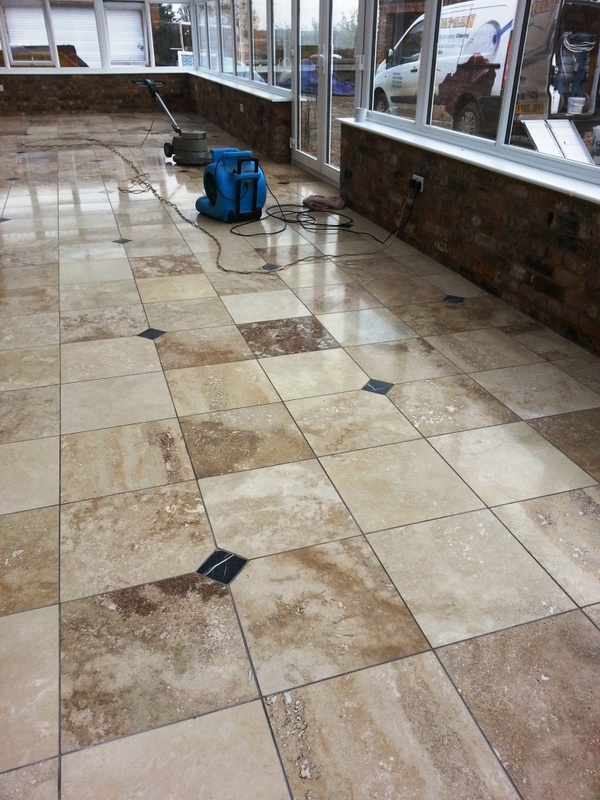 During this process the damage to the tiles started to fade and once the sealer was removed the tiles took on a washed out appearance which was to be expected at this stage. 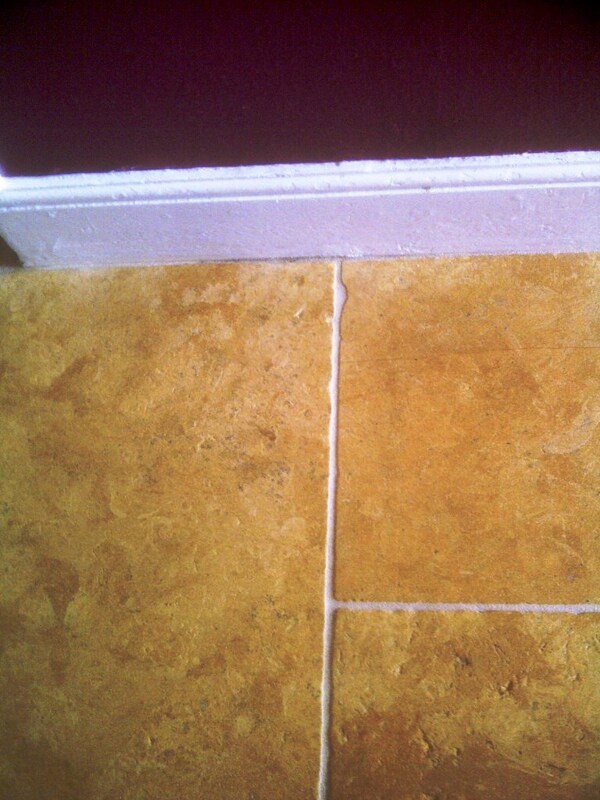 After drying any wetness with a heat gun I left them for a while so they could be sealed. 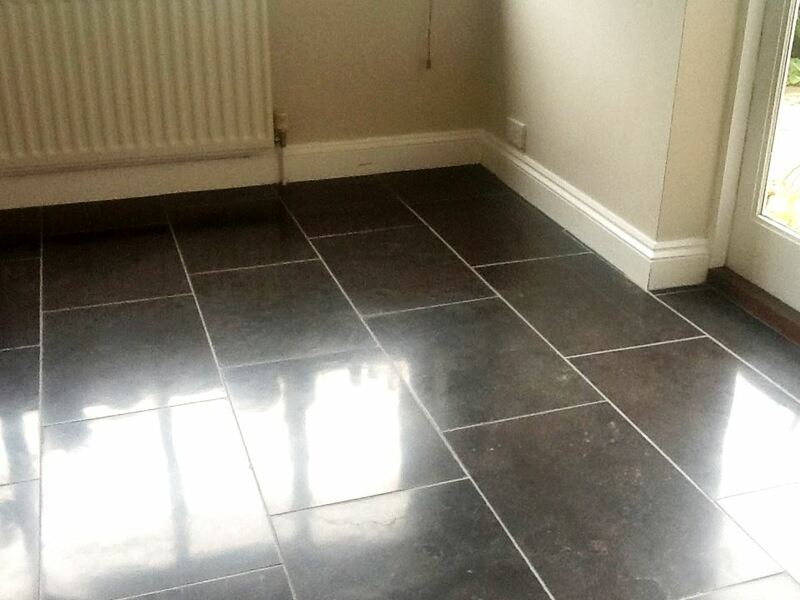 Assisted by the underfloor heating the tiles soon dried out so after about half an hour I was able to apply a coat of Tile Doctor Ultra Seal which is an impregnating sealer that leaves a natural look. 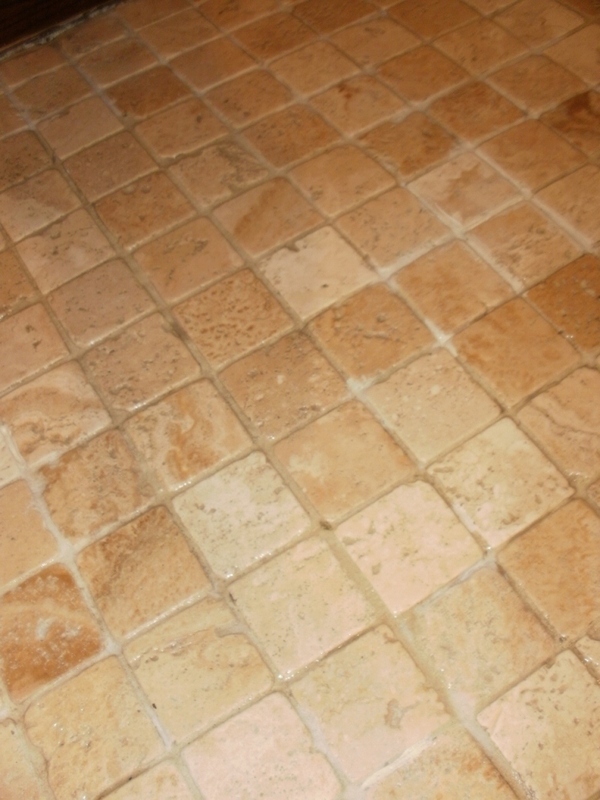 For the next couple of hours I added three more coats during which the tiles gradually came back to their previous colour. 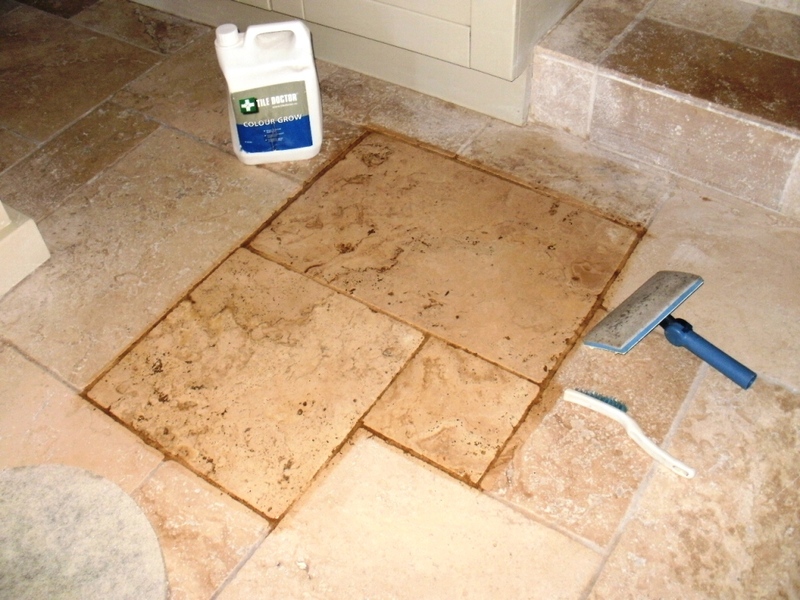 Each coat has to be fully dry before the next once can be added on. 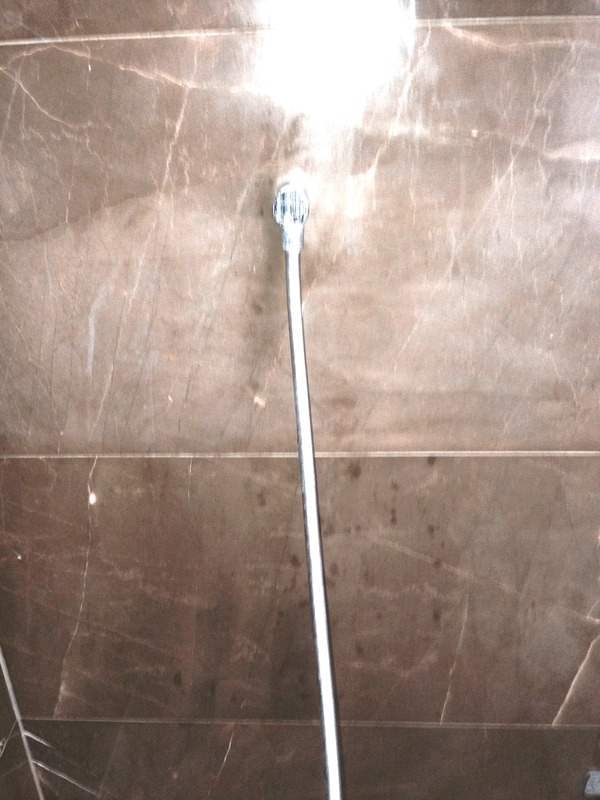 During the drying process I took the liberty of cleaning the customers shower unit, not something I’m in the habit of doing but it passed the time. 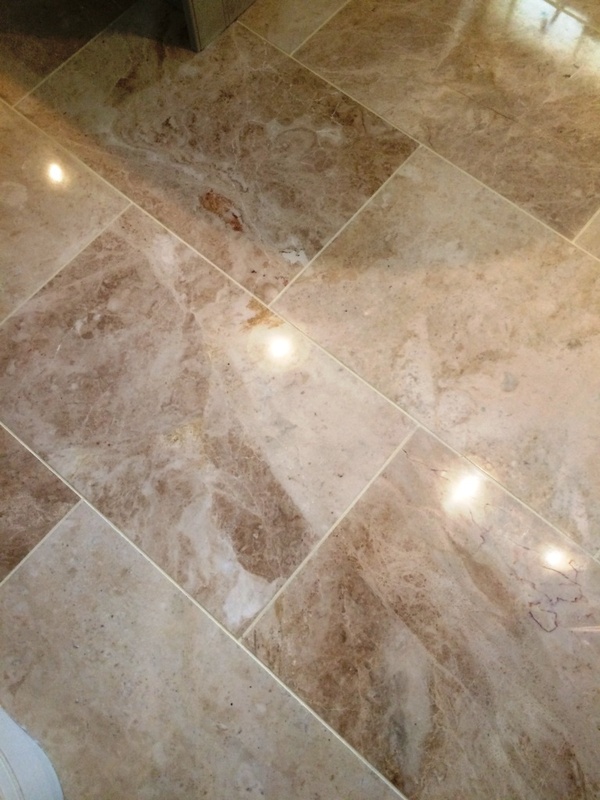 As you can see from the photographs on this page the white streaky damage caused by the Cillit Bang has now been removed and the surface looks as good as it did before. 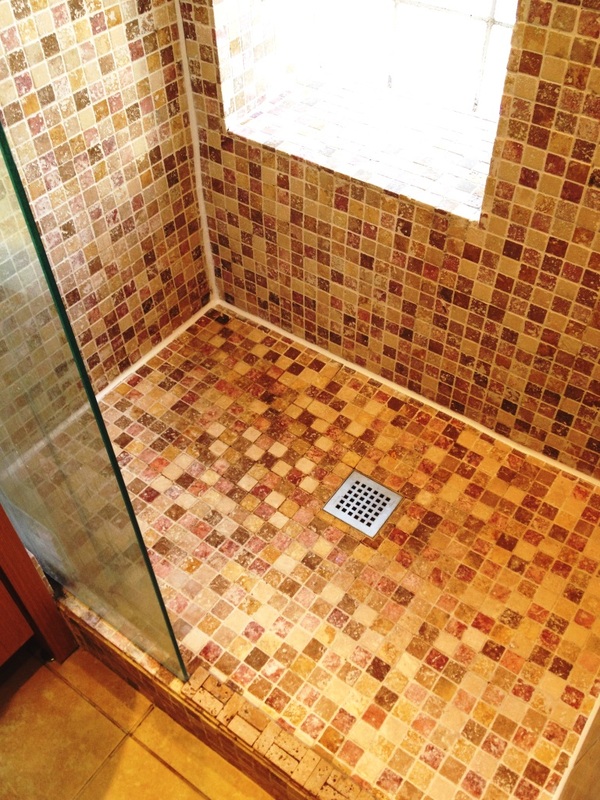 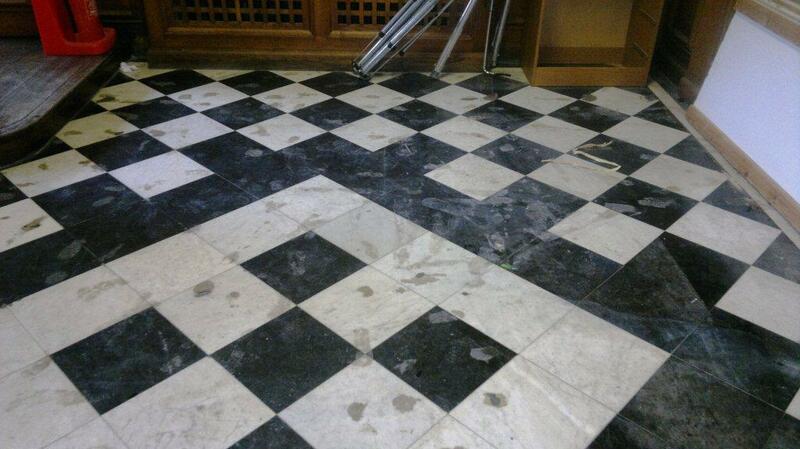 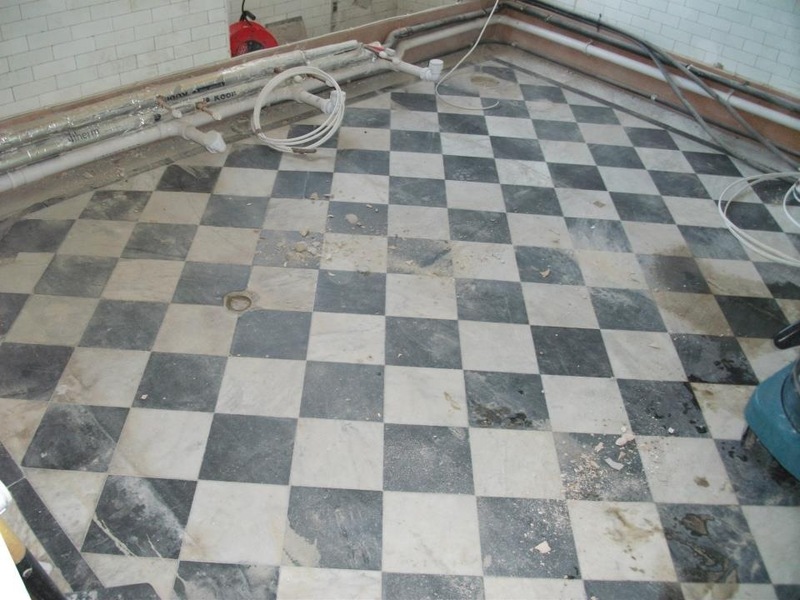 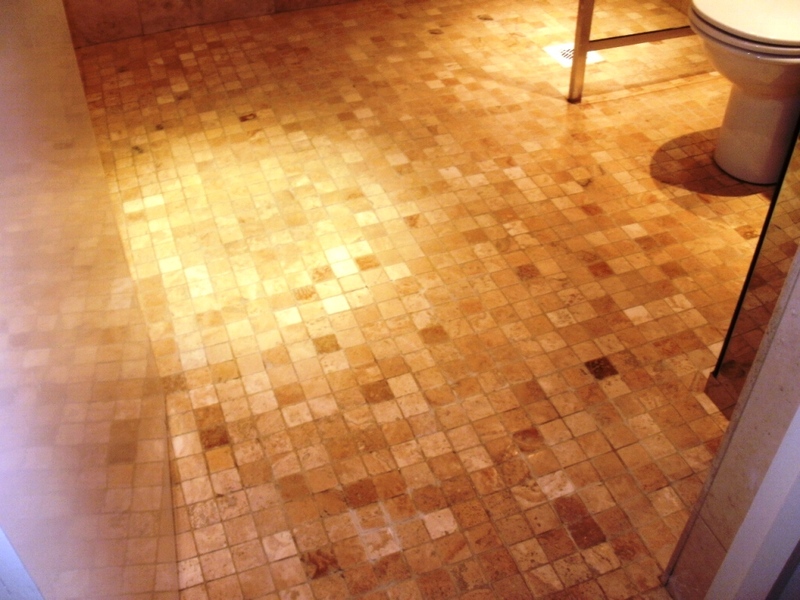 This Tumbled Marble mosaic wet room floor was installed in a house in London, SE1 four years before prior and was now looking a little tired. 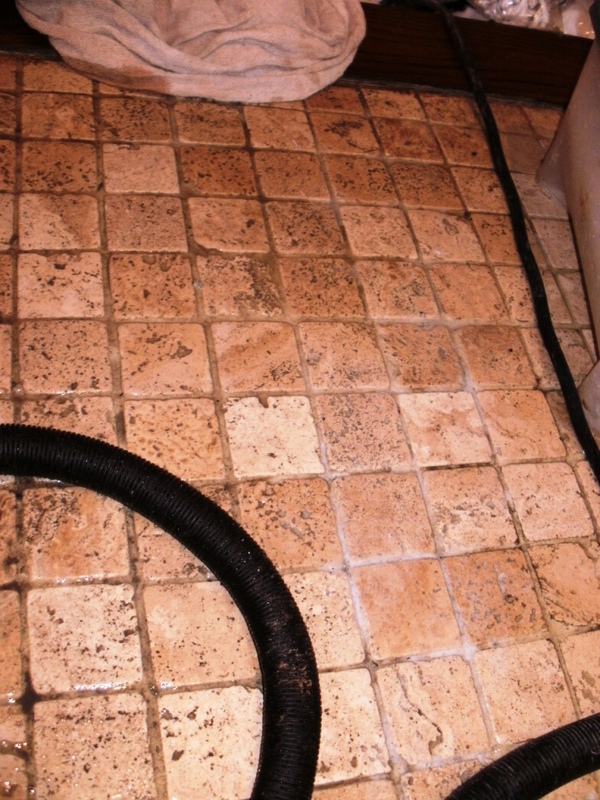 This was mostly caused by a build-up of Limescale which had then become grimy. 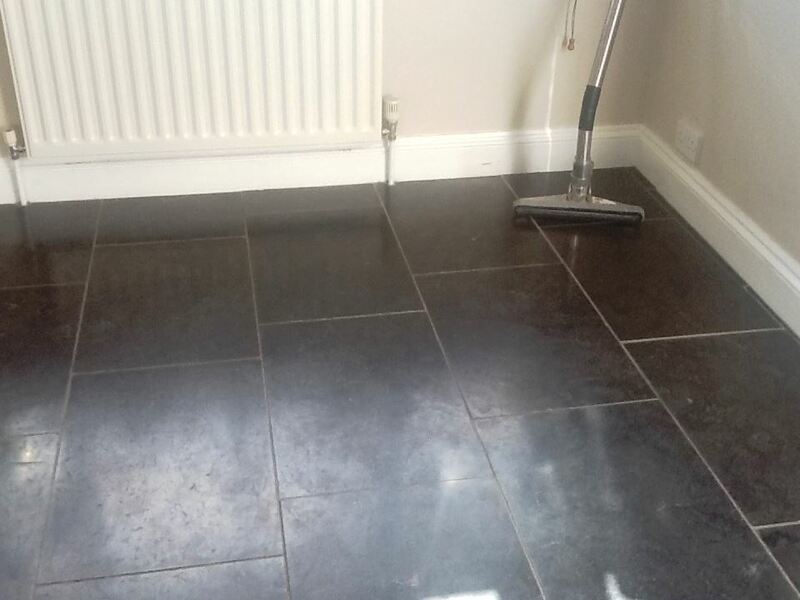 To treat the Limescale I used Tile Doctor Grout Clean Up which managed to remove most of the scale and to remove the remainder I steamed the tiles using an Earlex Steamer and carefully scraped any remaining Limescale residue away with a Stanley window scraper. 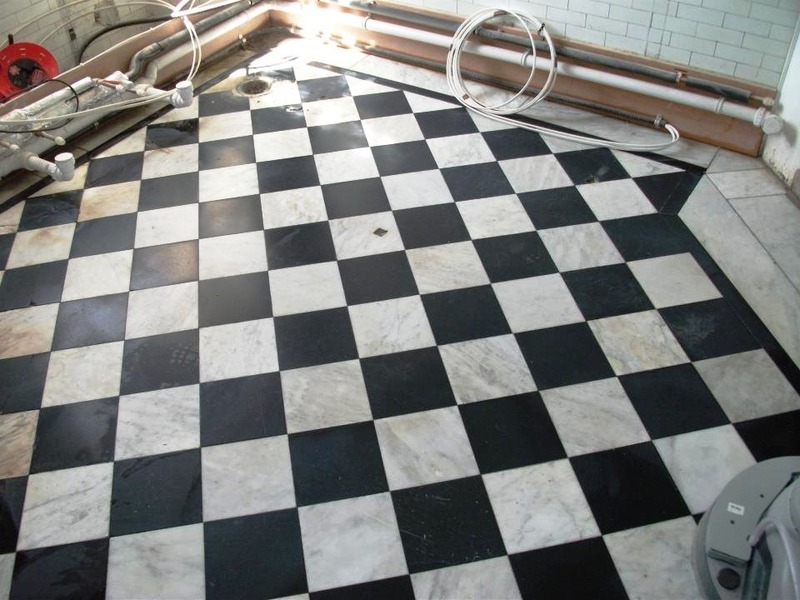 To restore the marble itself I used Tile Doctor burnishing pads to re-polish the tiles using 17″ pads on the main area and 8″ pads on a hand-held Clarke polishing machine in the corners. 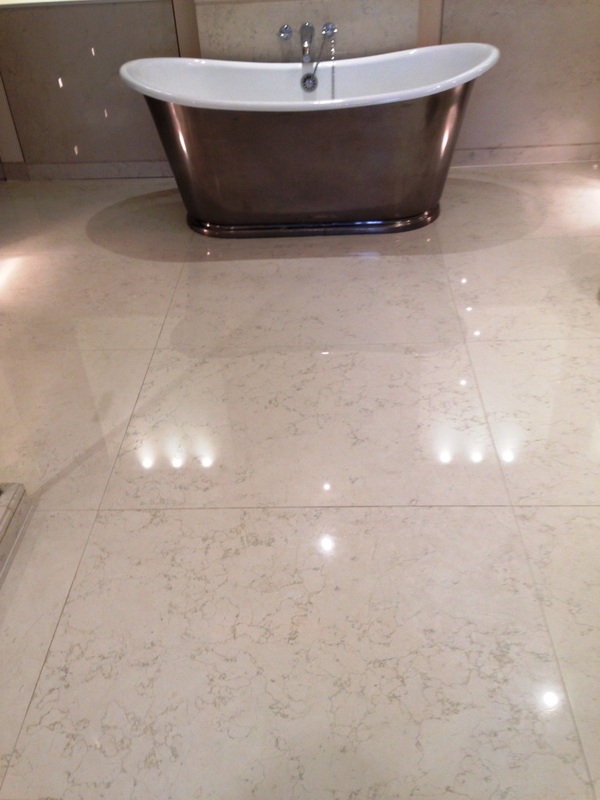 These diamond encrusted pads come in a number of different colours and are applied one after another with each pad being a finer grade than the last. 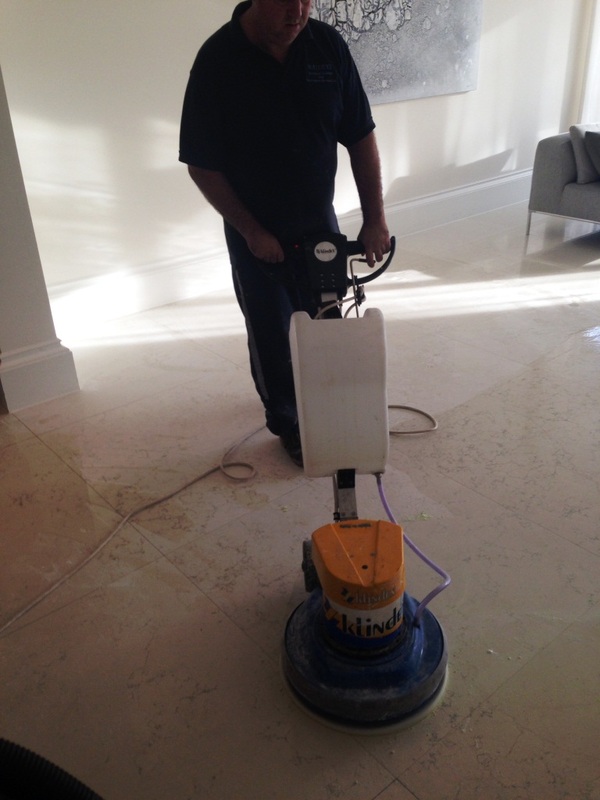 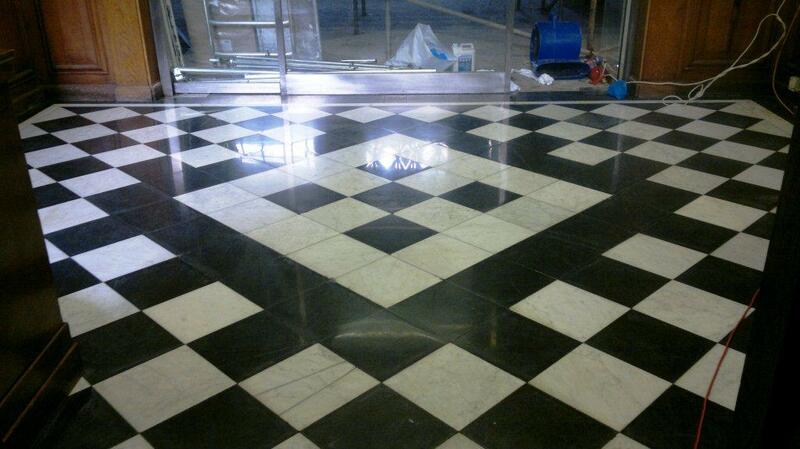 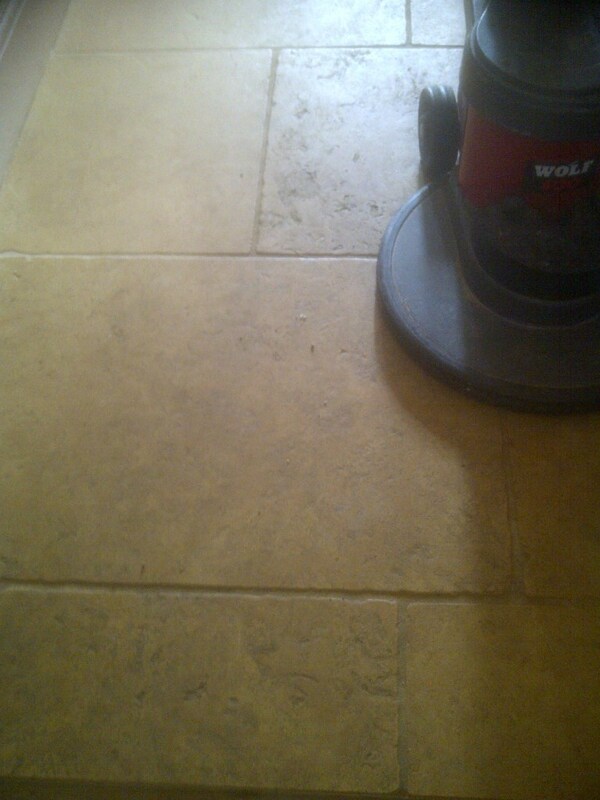 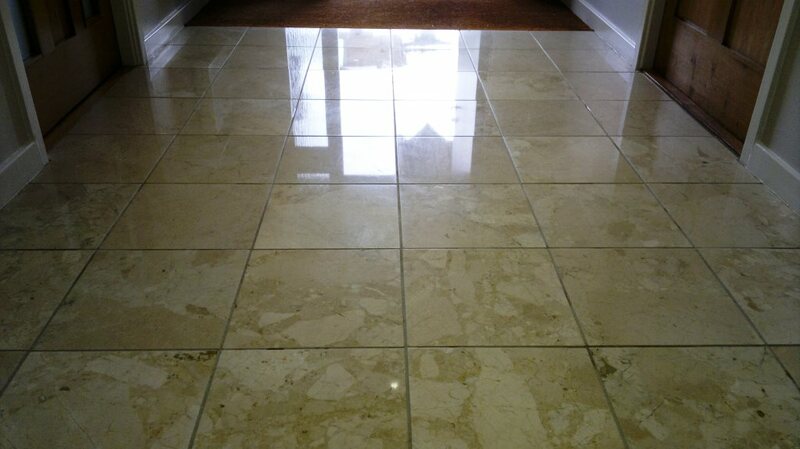 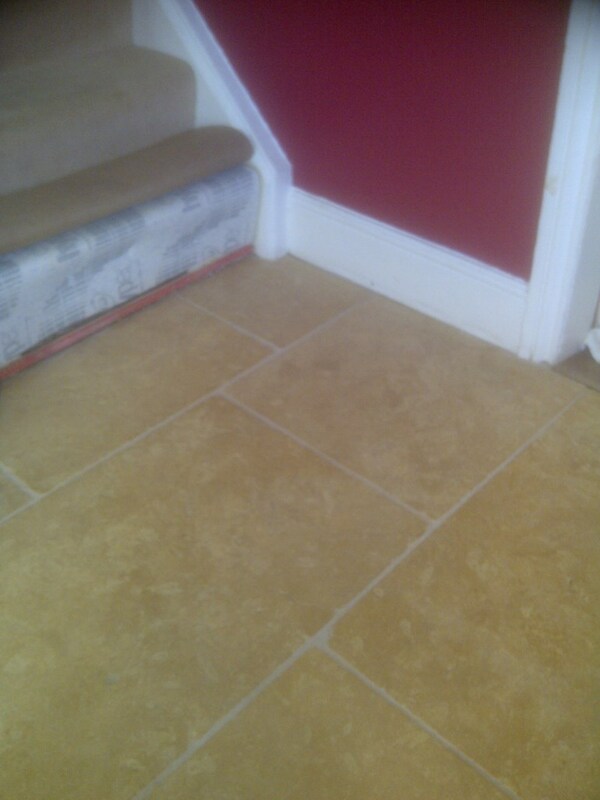 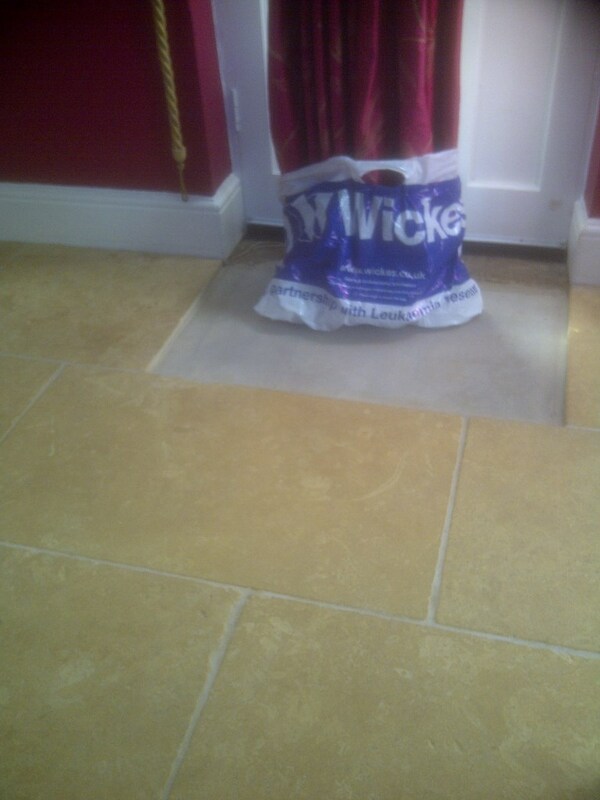 After thoroughly rinsing the stone again and removing the waste water with a wet vacuum. 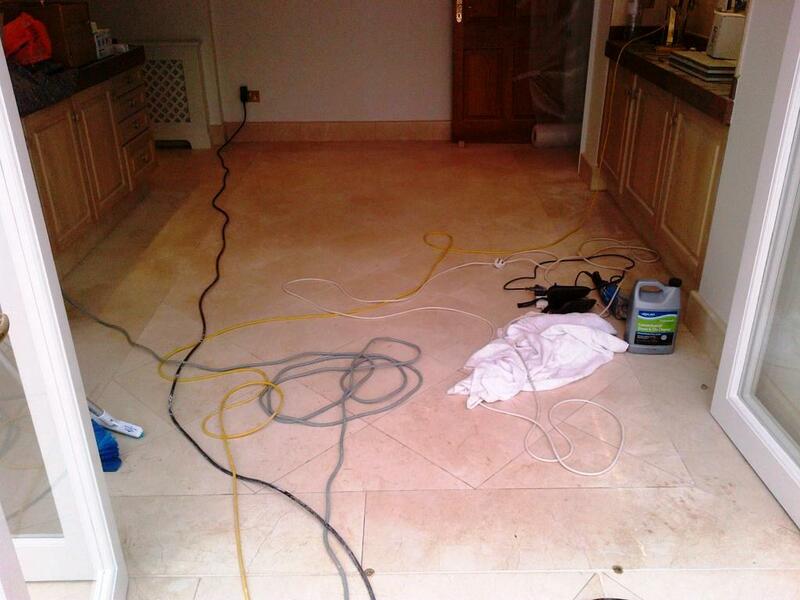 As the marble was naturally fast drying I used an Earlex heat gun to speed dry the floor and repeated this after lunch to ensure the floor was entirely dry before sealing. 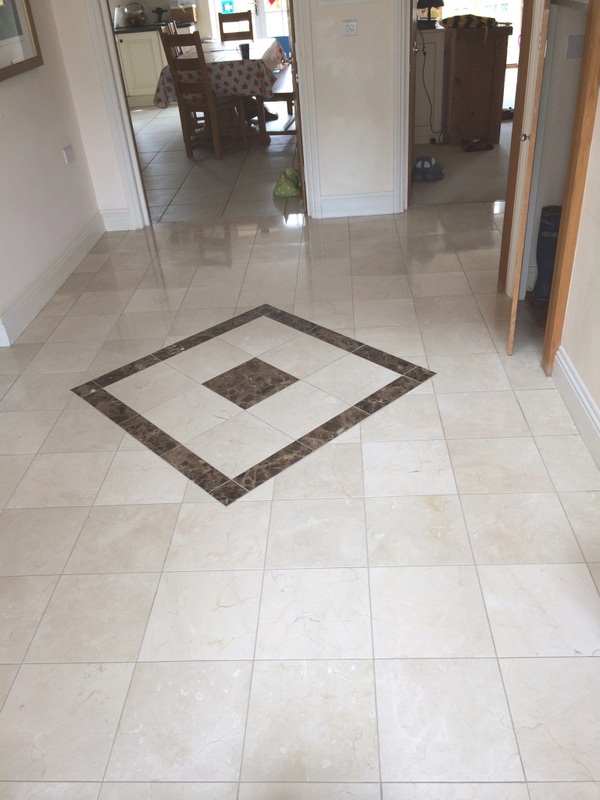 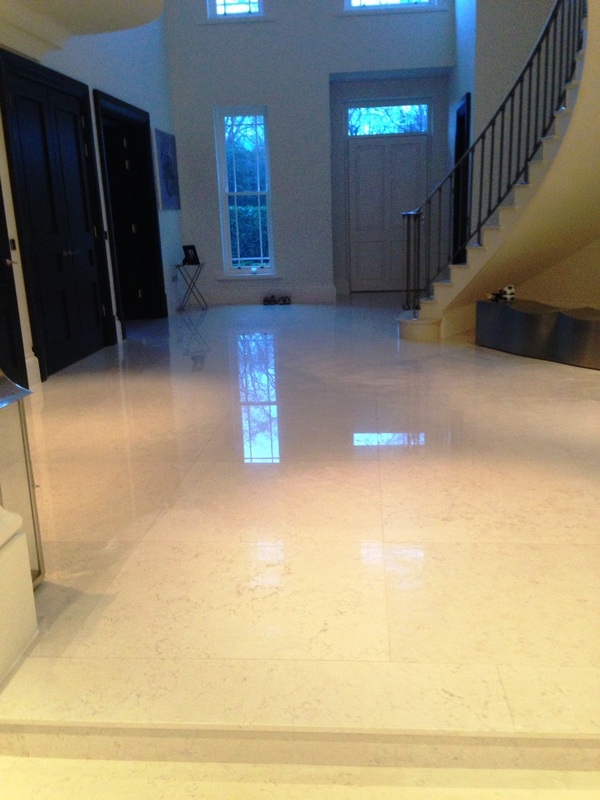 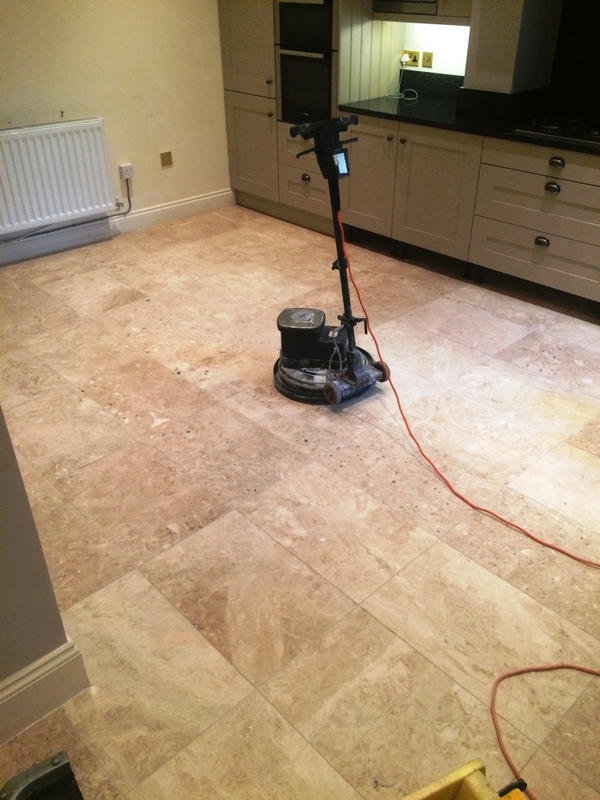 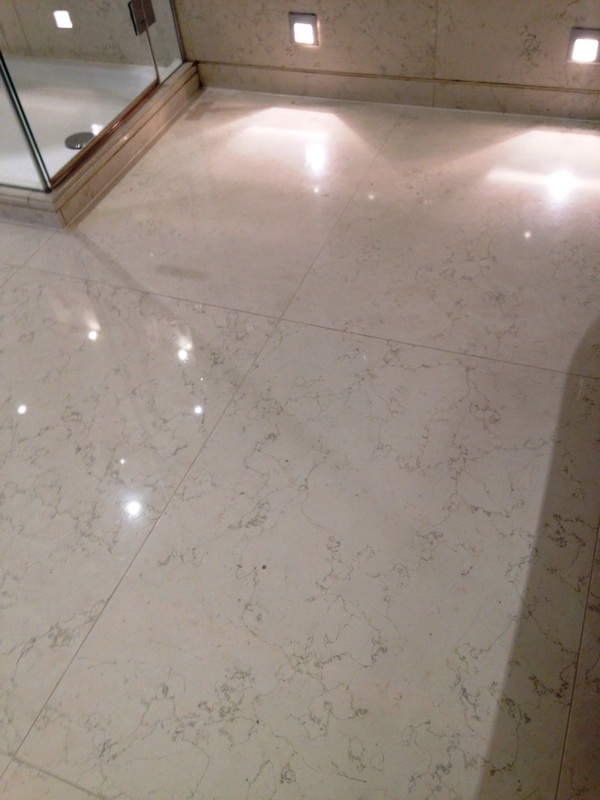 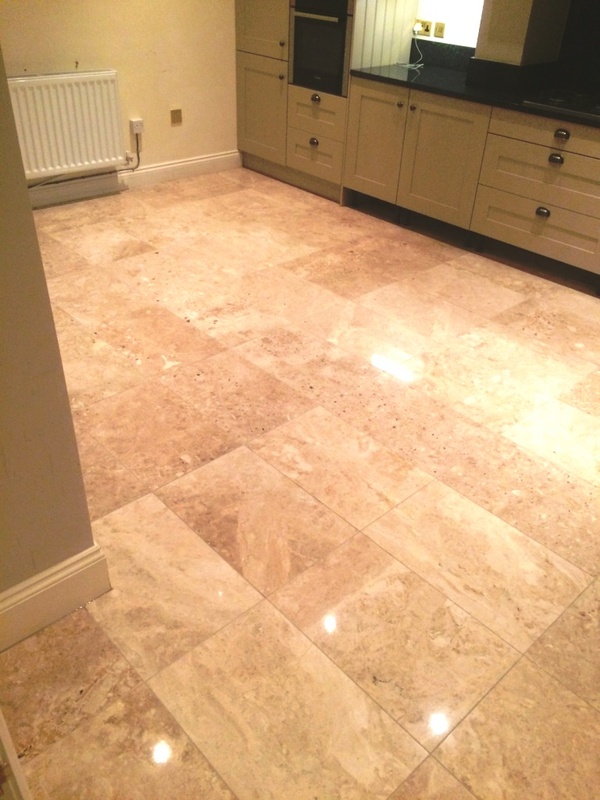 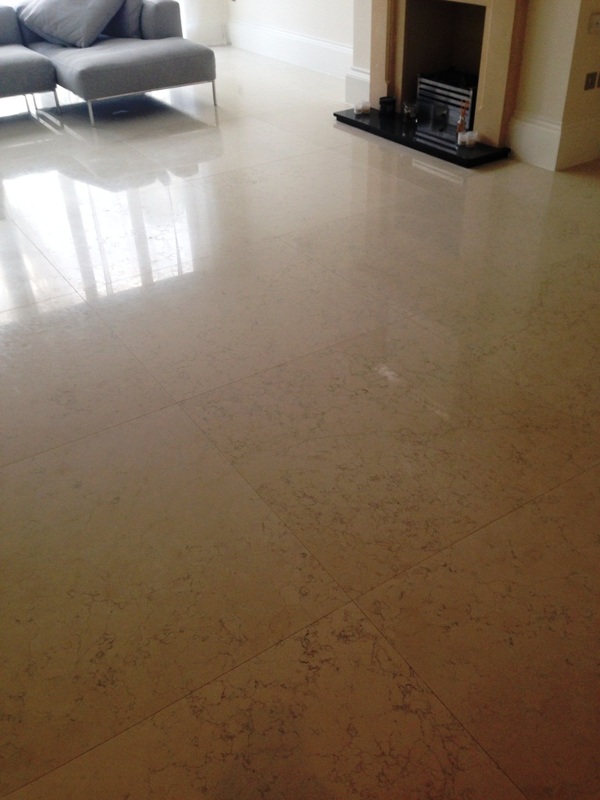 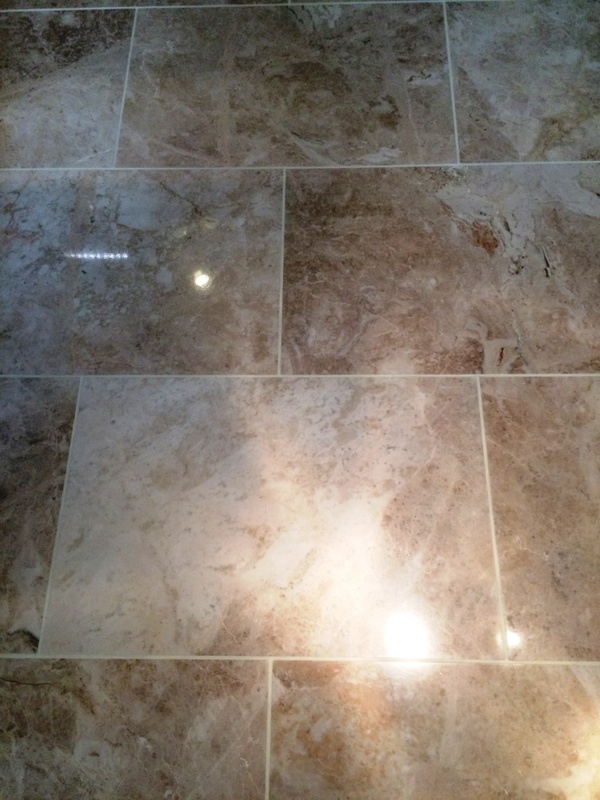 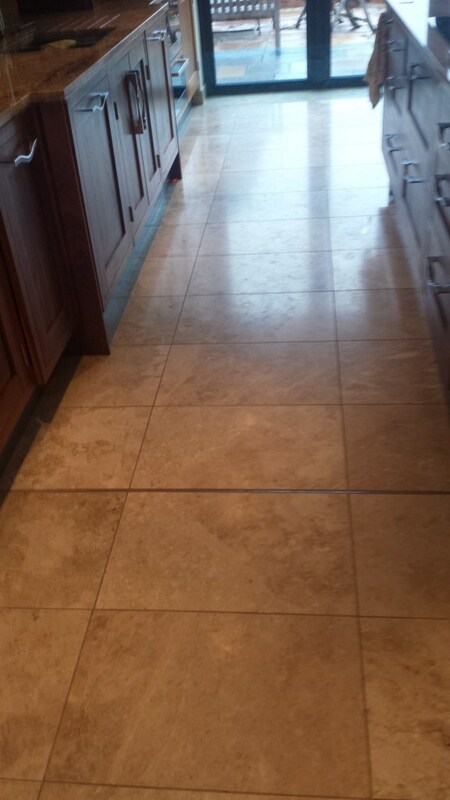 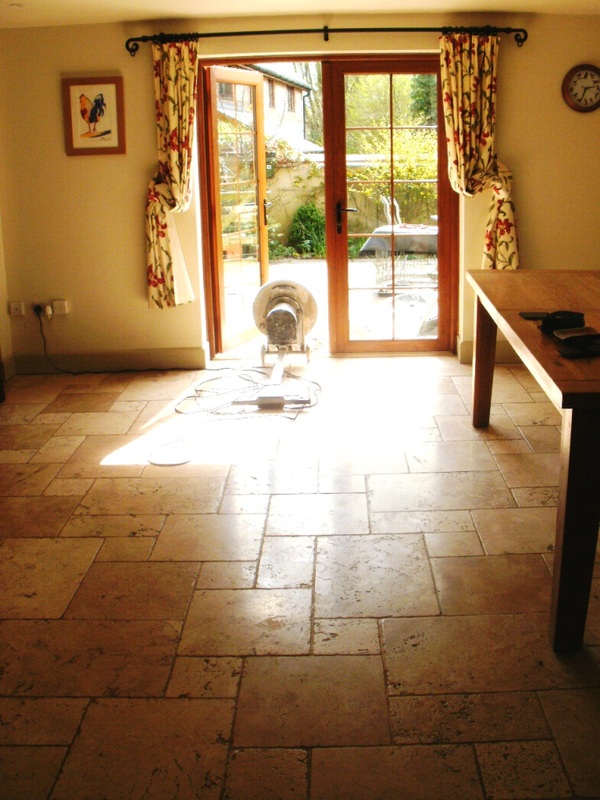 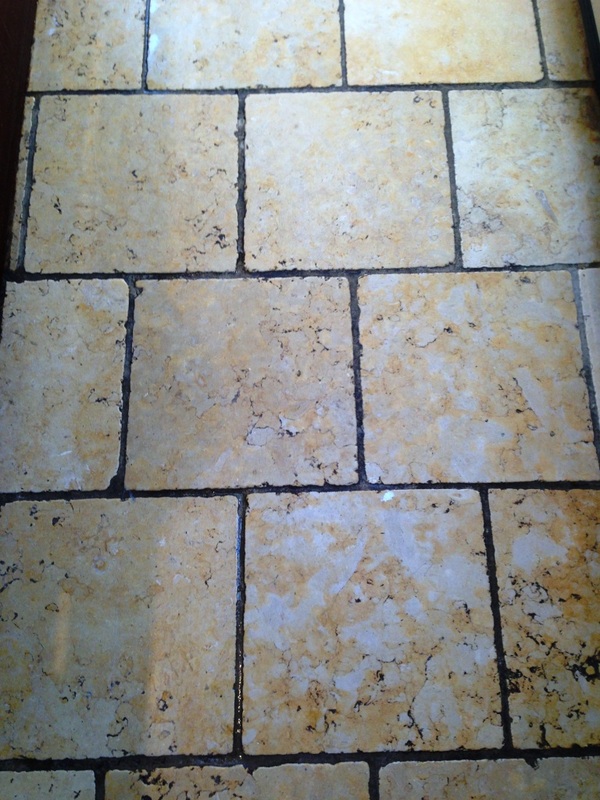 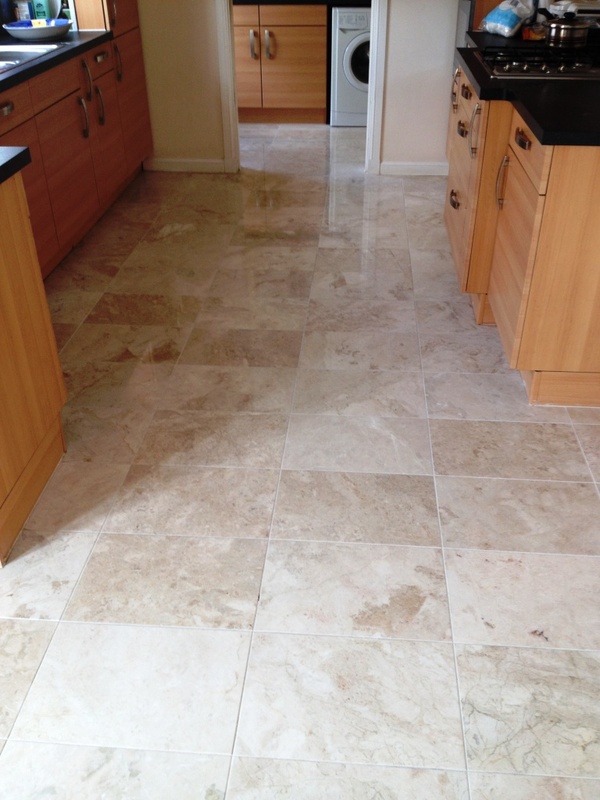 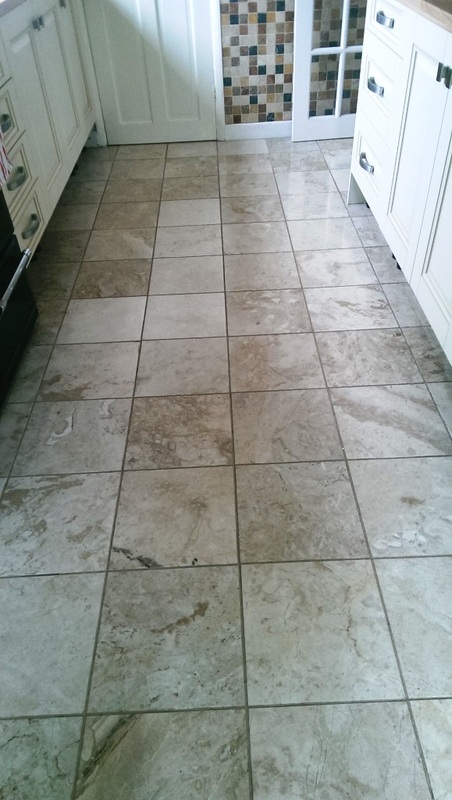 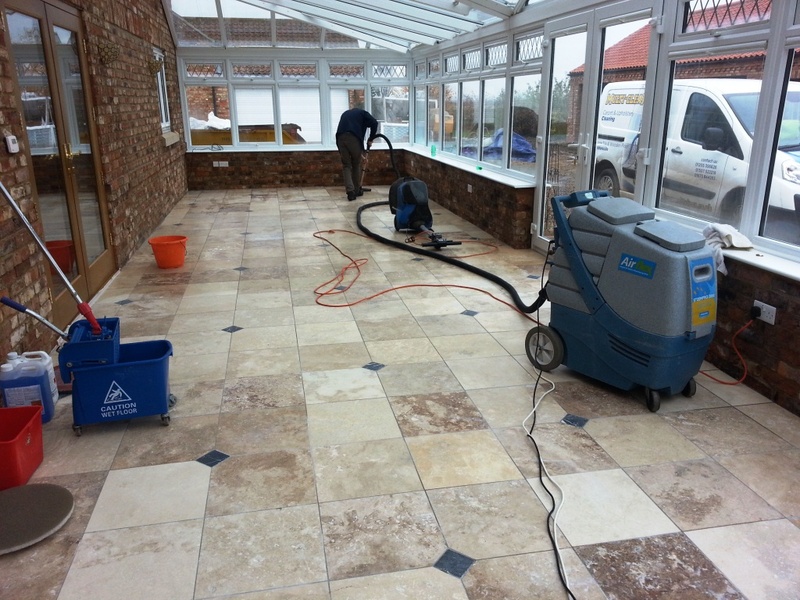 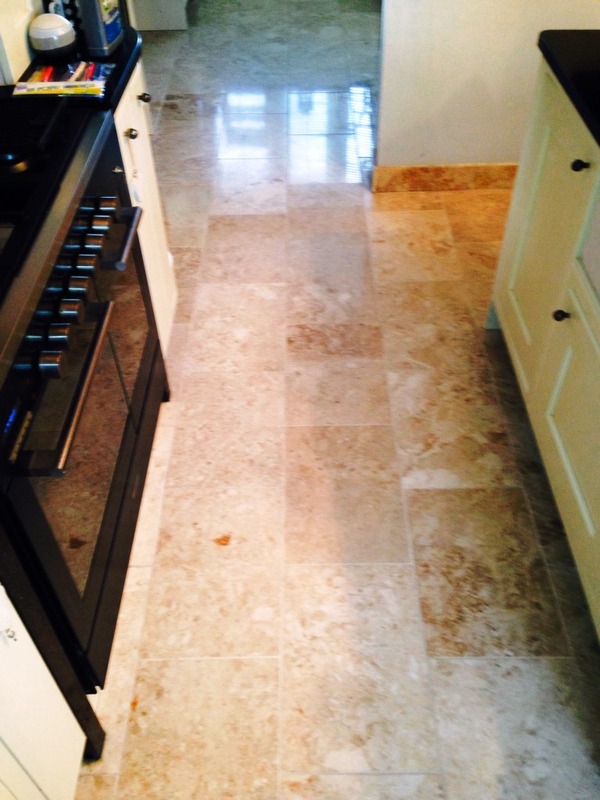 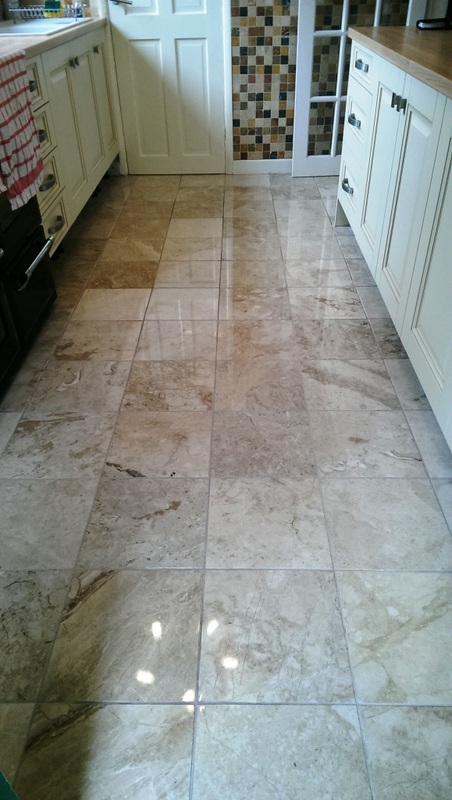 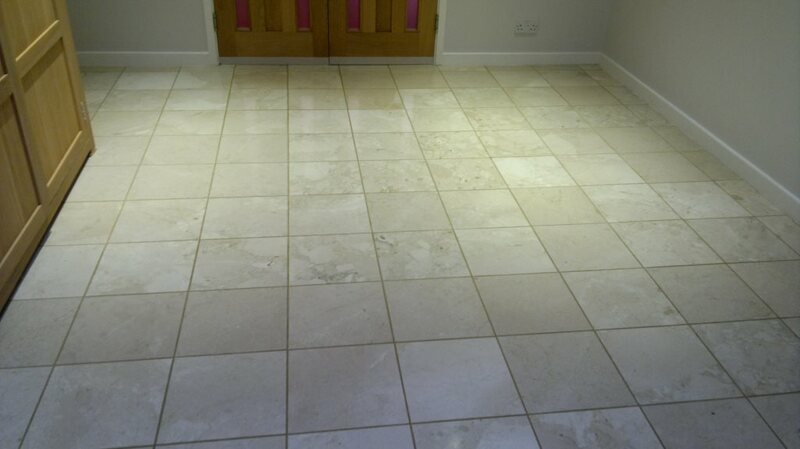 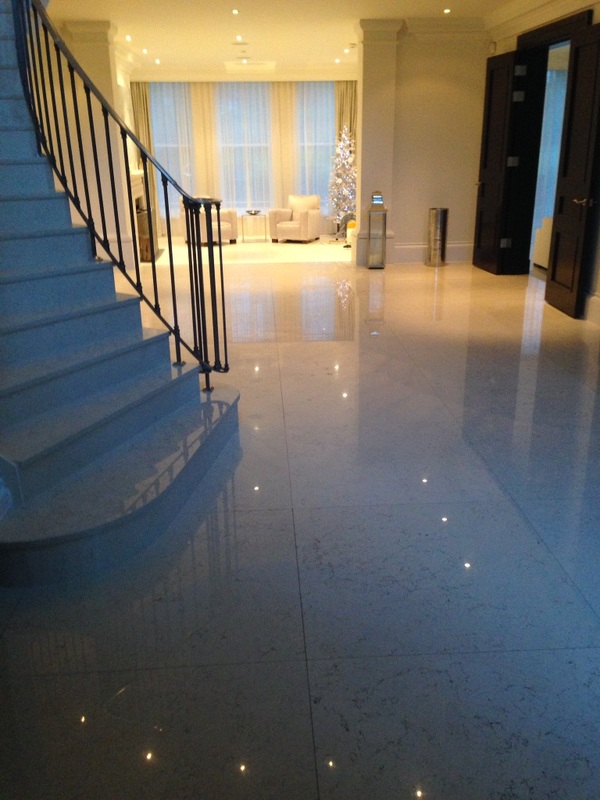 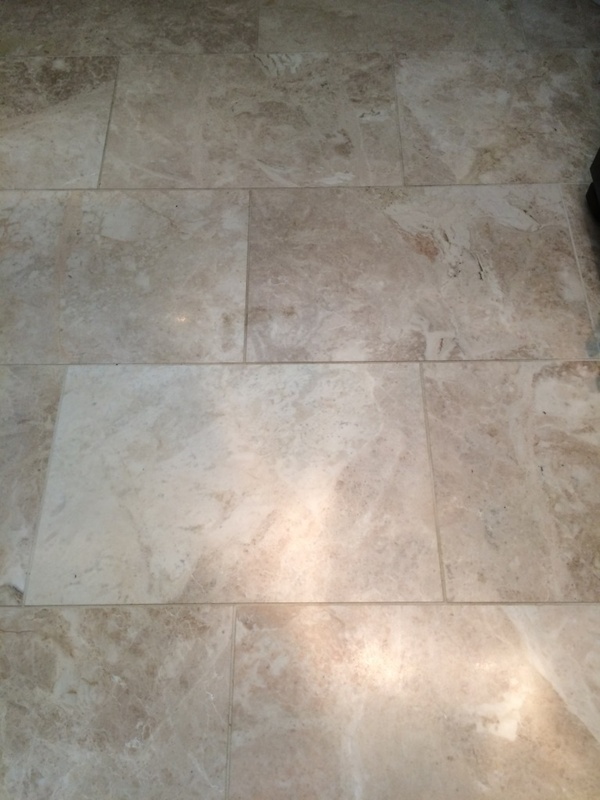 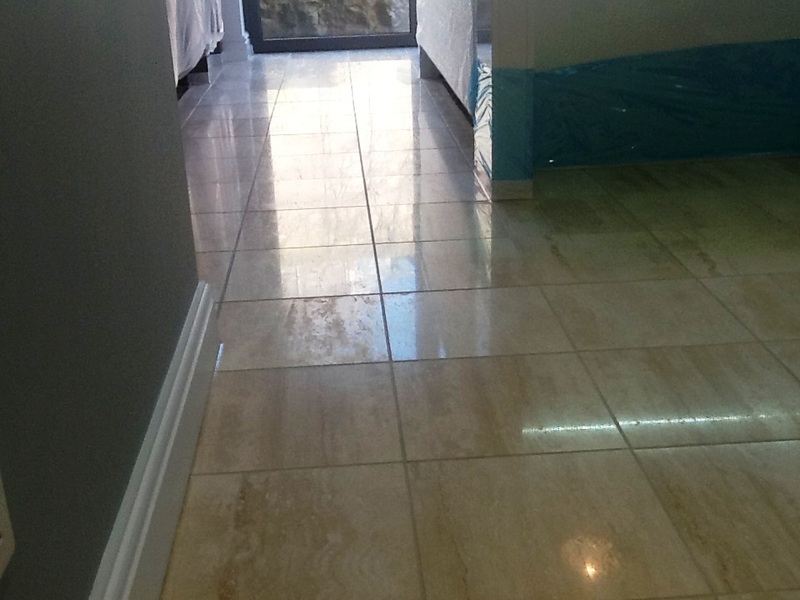 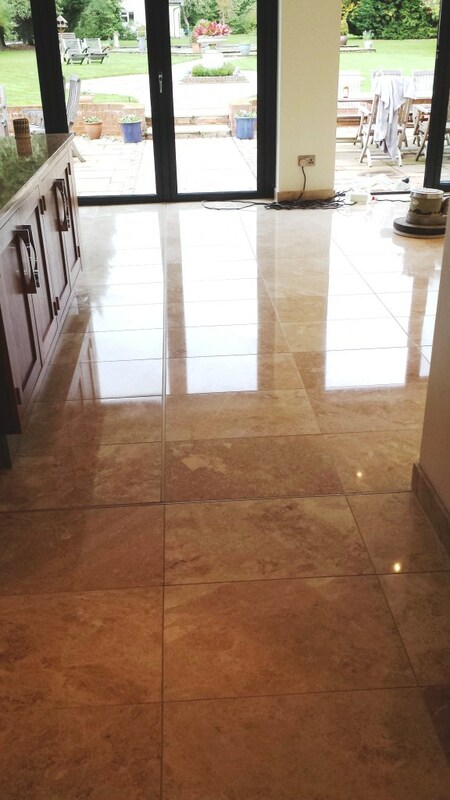 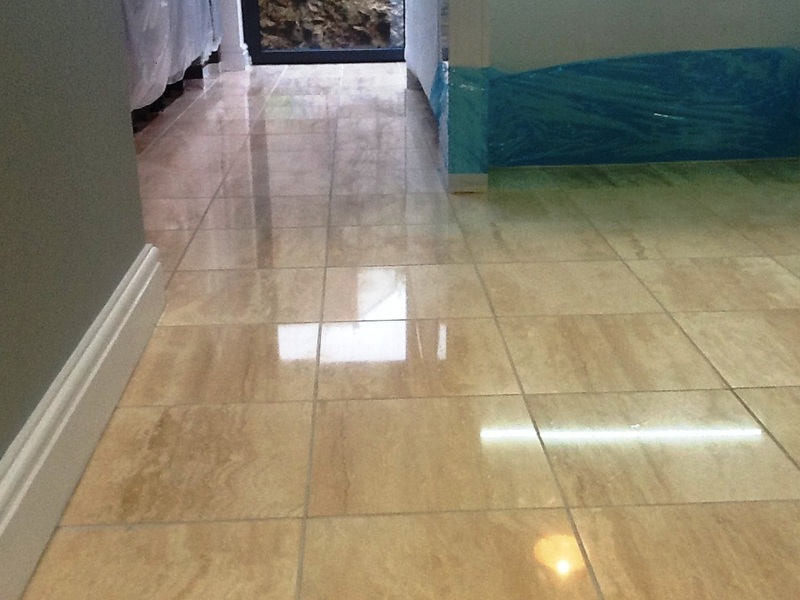 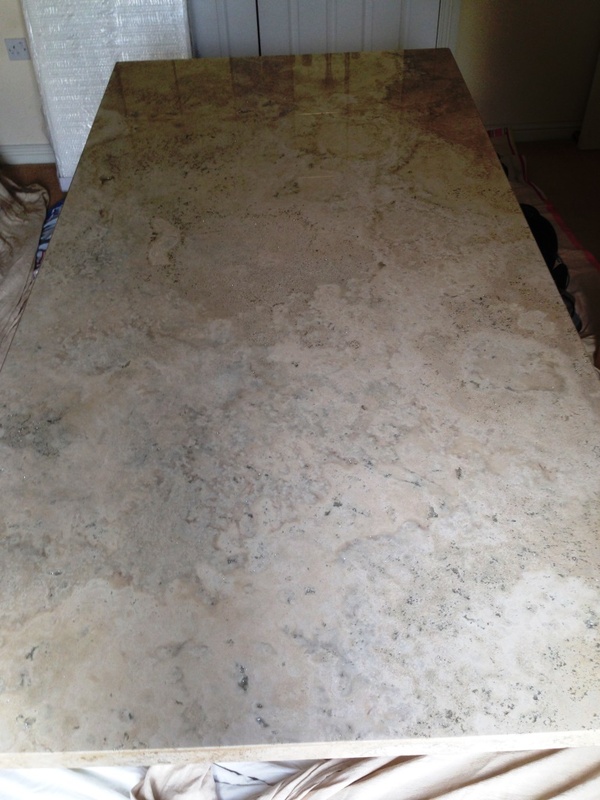 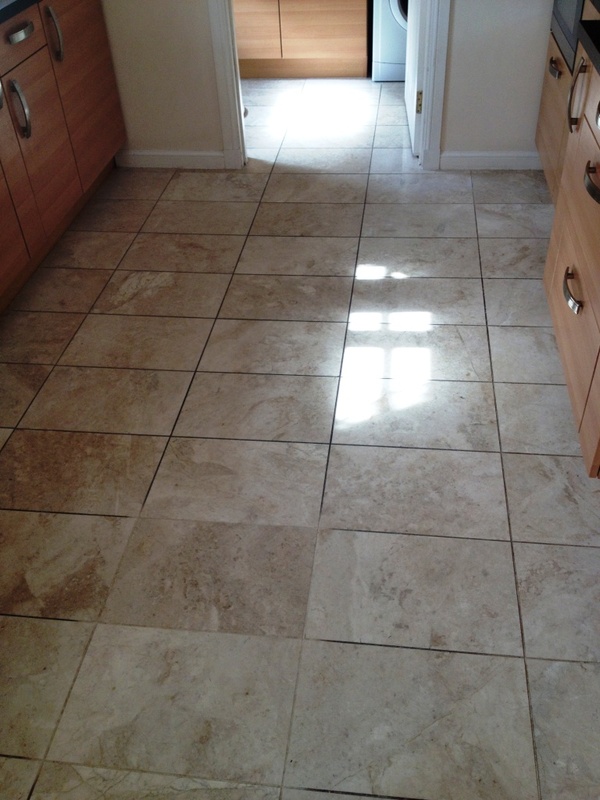 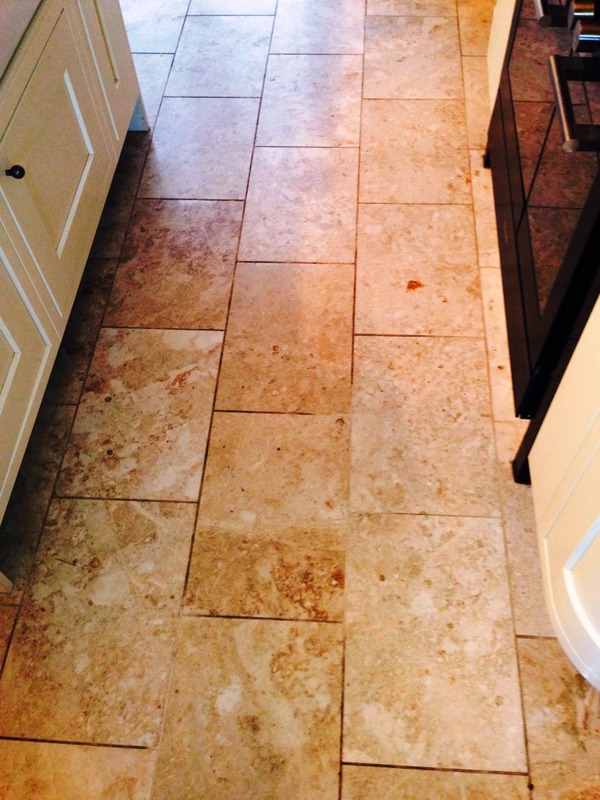 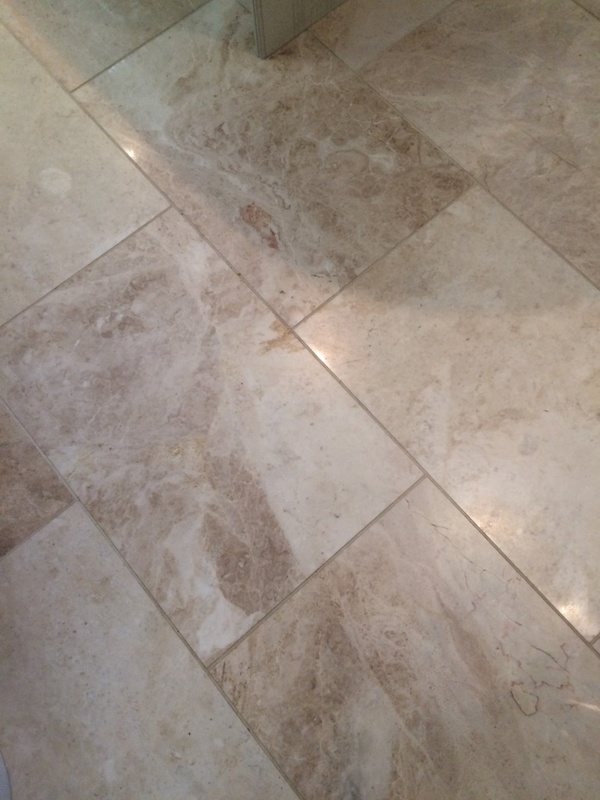 Once the Marble tiles were dry I started to seal them using two coats of Tile Doctor Colour Grow sealer which is a great choice for natural stone as it enhances the natural colours in the tile as well as providing stain protection. 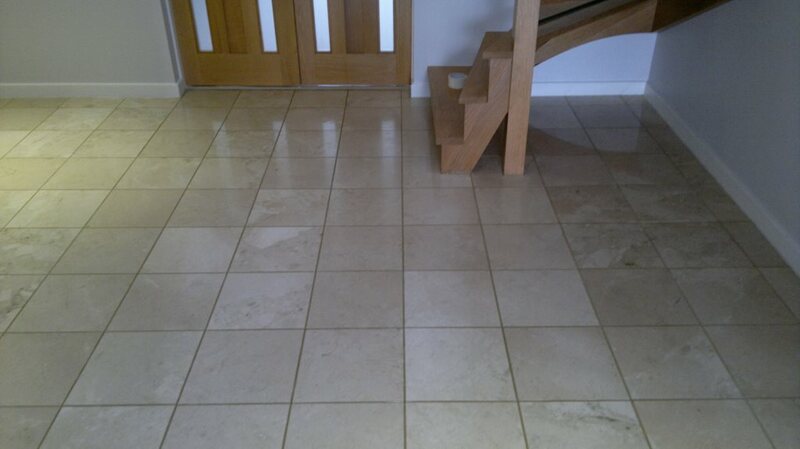 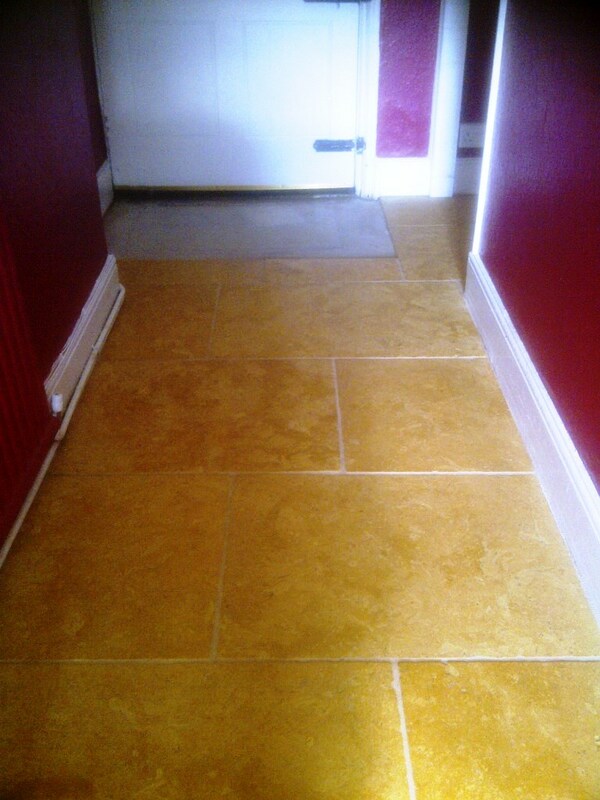 As the photographs show the results were very good and the customer was highly delighted.